For years, using Xiaomi phones meant facing MIUI out of the box. This changed with the Xiaomi Mi A1, which was the first Xiaomi phone to be powered by the Android One platform. The Mi A1 used the same Qualcomm Snapdragon 625 SoC as the Xiaomi Redmi Note 4, and its hardware was the same as the Xiaomi Mi 5X. However, it swapped out MIUI in favor of stock Android Nougat. In our review, we concluded that Xiaomi hardware coupled with stock Android software made for a delightful user experience. The Mi A1 provided a lot of value at its launch, but after nearly a year, it was beginning to show its age. In 2018, competition in the smartphone market has significantly increased in the budget and mid-range price segments, so it was natural to expect Xiaomi to release a successor. 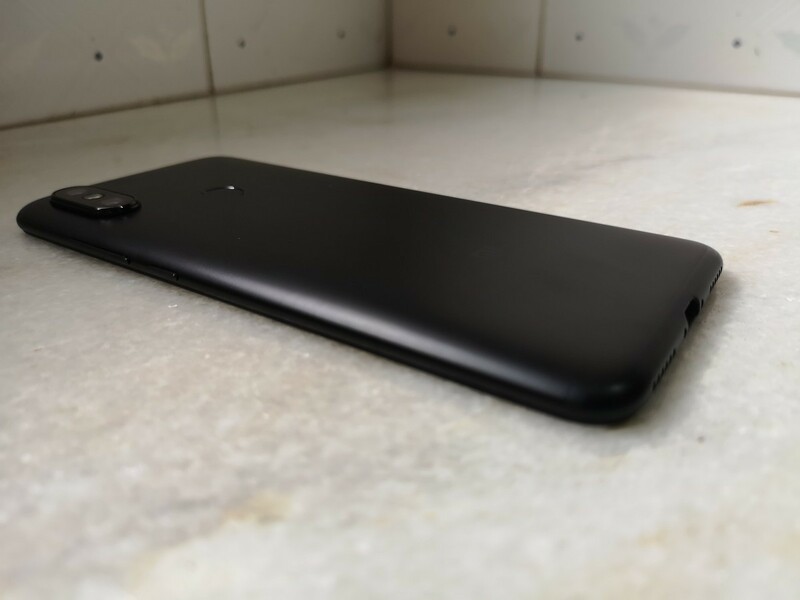 The Xiaomi Mi A2 and the Xiaomi Mi A2 Lite were launched in Spain in July, and the phones were the Android One variants of the Xiaomi Mi 6X and the Xiaomi Redmi 6 Pro respectively. In India, Xiaomi opted to launch the Mi A2 at the price tag of ₹16,999 ($238). The Mi A2 Lite was not brought to the country as Xiaomi opted to launch the MIUI-powered Xiaomi Redmi 6 Pro instead. The Mi A2 directly competes with many popular phones, including Xiaomi’s own Redmi Note 5 Pro, and the Honor Play. It also is priced only ₹4,000 less than the base variant of the Xiaomi Poco F1. 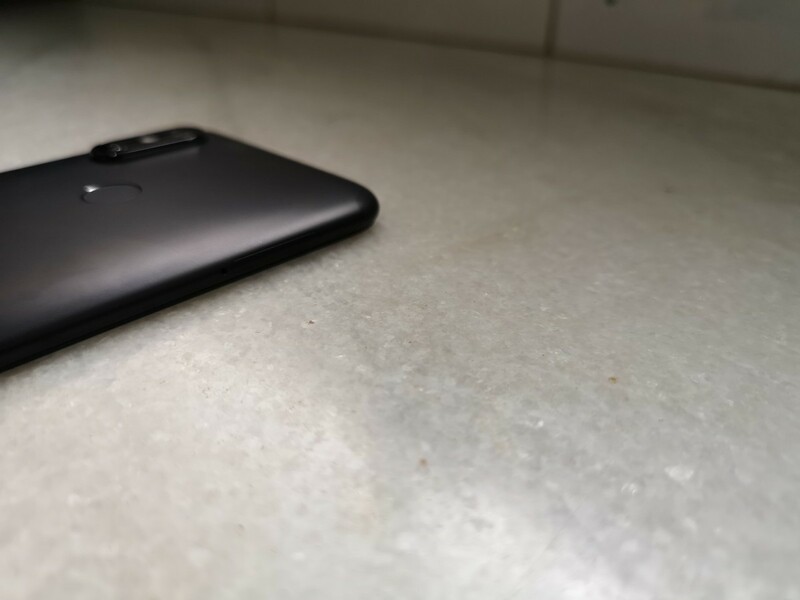 About this review: I have the Indian variant of the Xiaomi Mi A2. Over the course of the review period, I received the August 2018 security patch update and all software findings were made after the installation of the update. 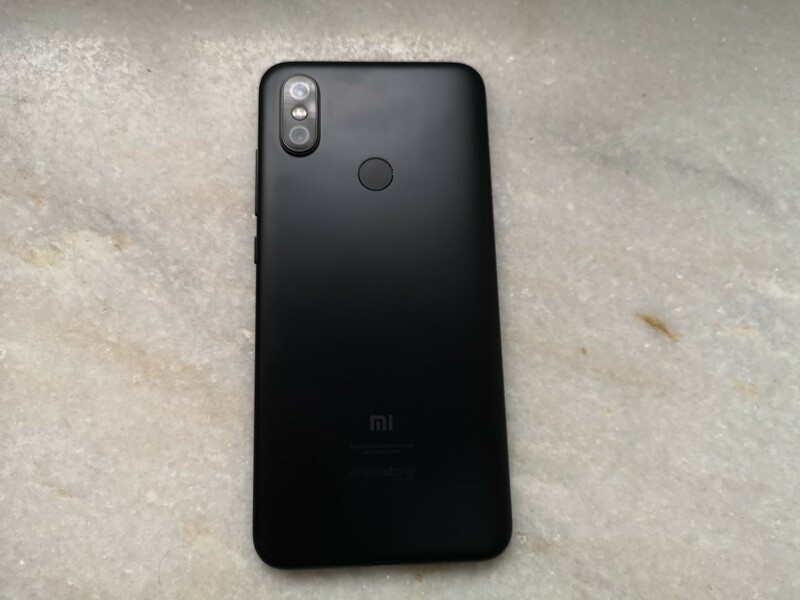 The review unit of the Mi A2 was provided by Xiaomi India for reviewing purposes. In terms of design, the Xiaomi Mi A2 is a breath of fresh air in the 2018 smartphone market. This is because of the phone’s excellent build quality. In 2018, flagship smartphones have almost completely switched away from metal to glass, introducing many trade-offs in the process. Opting for glass means that wireless charging is possible, but what’s undeniable is that glass makes phones more fragile. The Mi A2, on the other hand, stands out with its full unibody metal construction. 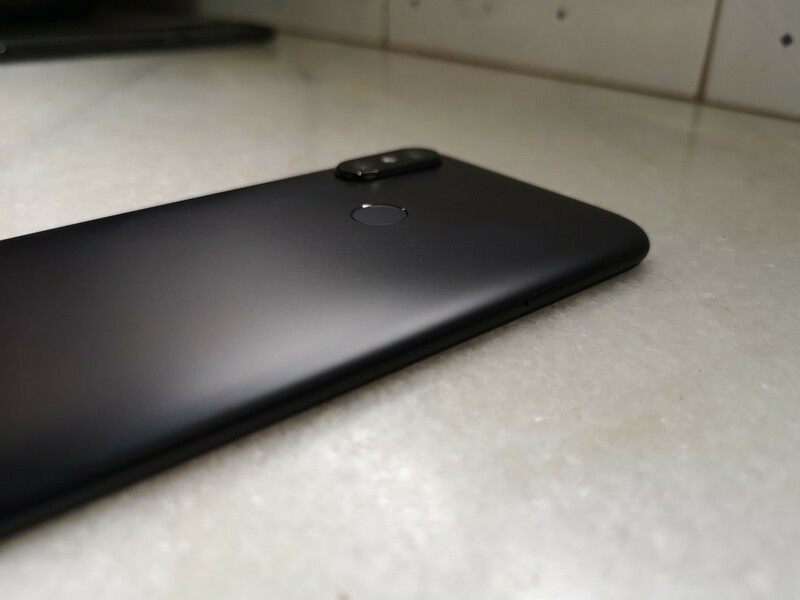 While the Redmi Note 5 Pro has plastic caps at the top and bottom of its back, the Mi A2 follows in the Mi A1’s footsteps by going with a unibody aluminium construction. The discreet antenna bands are hidden at the top and bottom like the Mi A1. The use of metal provides structural rigidity. Build quality is top-notch, and it’s the best that users will get at this price range as more and more phones make the move to glass. Metal is inherently more durable than glass, and I can’t praise Xiaomi enough for resisting the move to a glass backplate in its mid-range phones. The feel of cold, sand-blasted unibody aluminium remains fantastic. With respect to build quality, the Mi A2 is arguably even better than some flagship phones. This is because the metal construction reduces the chances of catastrophic damage in the event of a drop. I also haven’t seen any scuff marks or scratches accumulate on the metal back after a few weeks of use. The front of the Mi A2 is taken up by the 5.99-inch 18:9 display. There is no display notch. Instead, the phone has symmetrical bezels on the front top and bottom. The top and bottom bezels are bigger than the ones found in 2018 flagship devices, but they’re only slightly bigger than the OnePlus 5T, for example. The screen-to-body ratio is a tad low at 77.4%, but it’s acceptable in this price range. Most competitors in this price range have lower screen-to-body ratios. Xiaomi also maintains symmetry with the placement of the front-facing camera, earpiece, and ambient light/proximity sensors. On the top of the device, we find the microphone and an IR blaster. The IR blaster is increasingly uncommon these days, as only Xiaomi and Huawei are opting to keep it. It may have niche use cases, but in our view, it’s still worth retaining in smartphones. The right-hand side contains the power and volume buttons. Tactile feedback on the buttons is superb, with a well-defined press. In terms of stiffness, the Mi A2’s buttons are a marked improvement over past Xiaomi budget phones, and they even compete with buttons of flagships such as the Huawei P20 Pro. Their placement is also good, and all in all, I had nothing but praise for them. The left-hand side of the phone contains the SIM tray, which contains dual nano SIM slots. 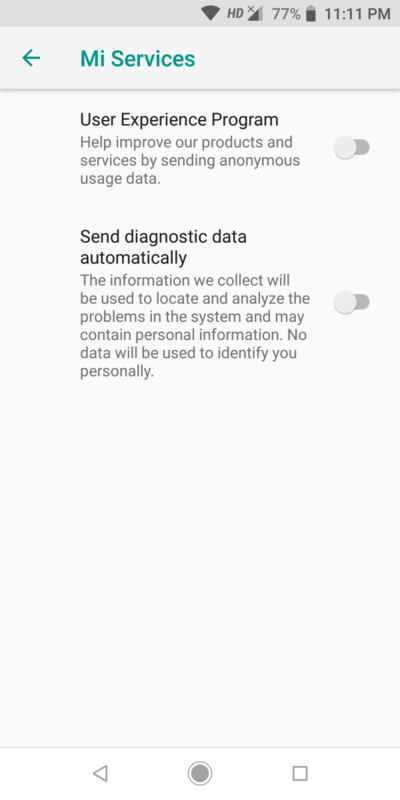 Unfortunately, the Xiaomi Mi A2 does not have a microSD card slot. 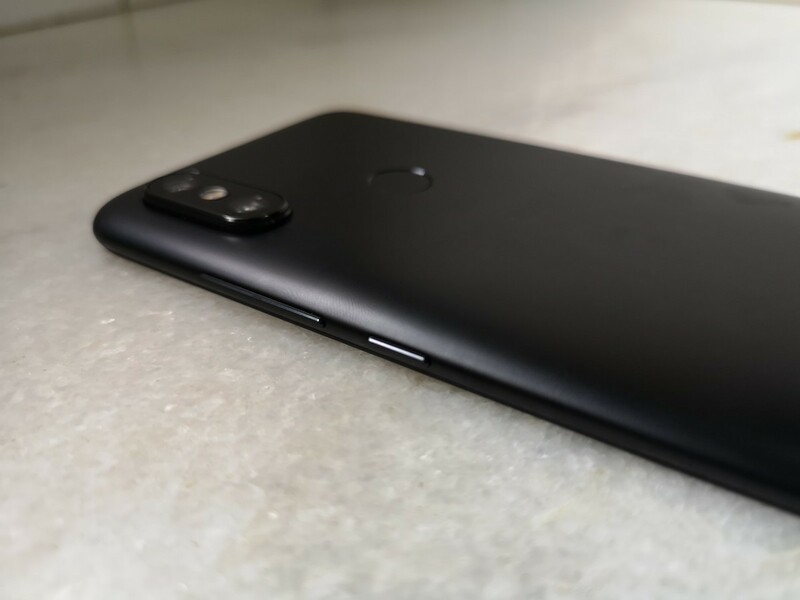 The Redmi Note 5 Pro and other Xiaomi mid-range phones opted to go for a hybrid (nano-SIM + nano-SIM/microSD) configuration in the past, but the Mi A2 drops the hybrid solution in favor of just having two SIM slots. This can have a negative impact on sales, especially in markets where expandable storage has historically been a core feature. As there is no option for expandable storage, users will have to choose their internal storage configurations beforehand. In India, the phone is currently being sold in only one variant: 4GB of RAM with 64GB storage, with the 6GB RAM/128GB storage variant due to launch at a later date. In other markets, Xiaomi also sells a base 4GB RAM/32GB storage variant. On the bottom of the device, there are two speaker grilles. In reality, there is only one functional speaker (we will discuss its audio quality in the Audio section). The USB Type-C port supports USB 2.0 speeds, but it is nevertheless an upgrade over the Redmi Note 5 Pro’s outdated micro USB port. 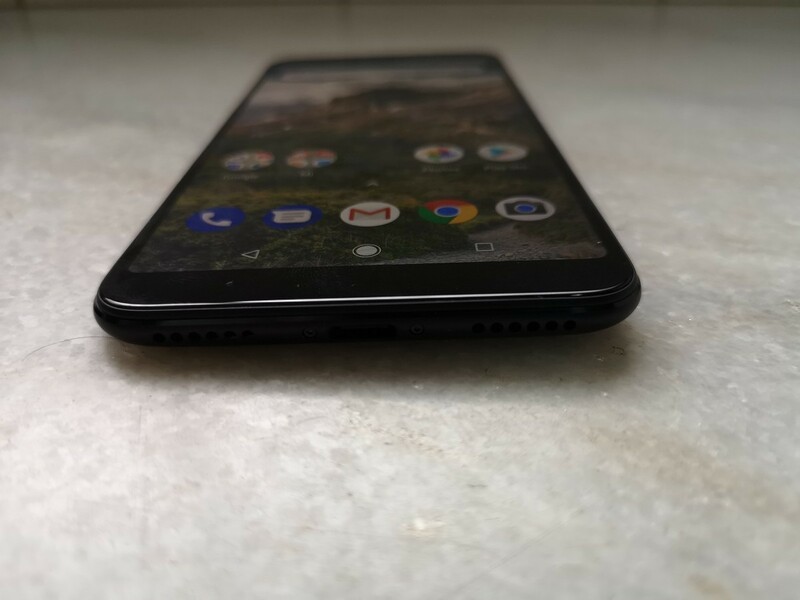 There is no 3.5mm headphone jack on the Mi A2, making it the first Xiaomi mid-range phone to skip on providing the headphone jack. We’ll have more to say on this in the Audio section. The 2.5D Corning Gorilla Glass 5 seamlessly curves to the metal body. 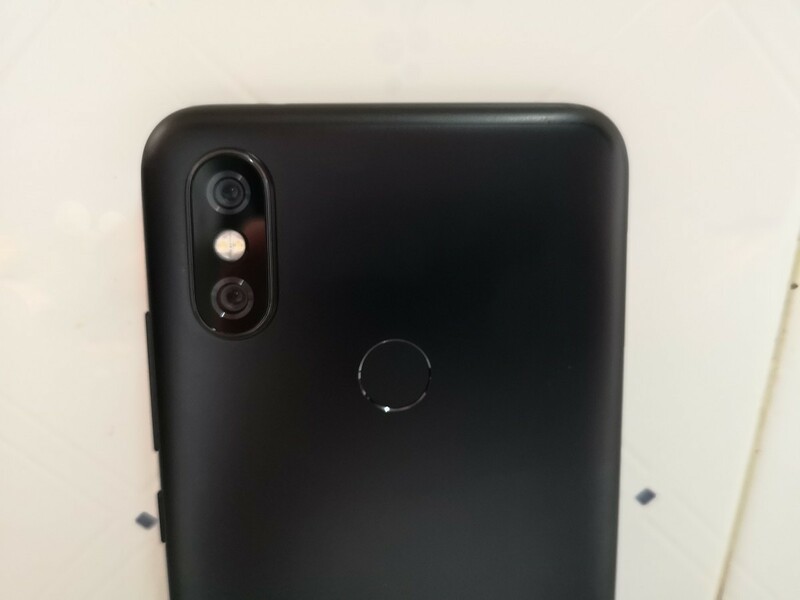 On the back, the dual rear cameras are placed on the top left in a style reminiscent of the Apple iPhone X, while the fingerprint sensor is placed in a centered layout. The placement of the fingerprint sensor is great. However, the dual rear cameras stick out significantly from the back, causing the phone to wobble on a flat surface. I’m not the greatest fan of camera bumps, and the Mi A2 takes them one step further by going with a significantly thick one. This is because the phone is extremely thin at 7.3mm, and predictably, this has the expected negative impact on battery capacity, which is significantly smaller than the one found in Redmi Note 5 Pro at 3,010mAh. 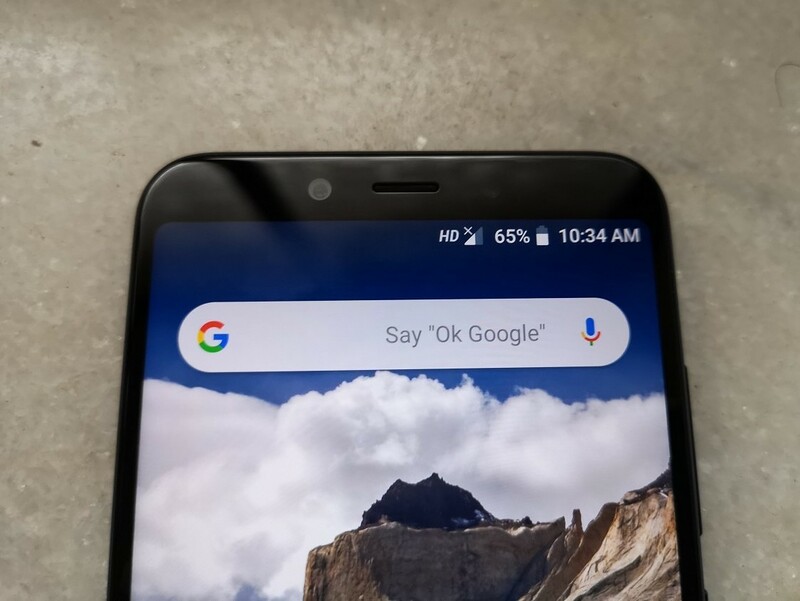 The Android One logo is placed at the bottom on the back. In terms of ergonomics and handling, the Xiaomi Mi A2 provides an excellent experience. The aluminium back has a fingerprint-resistant coating, and it feels great in the hand. It is quite slippery, but that’s an expected trade-off with the sand-blasted aluminium finish. 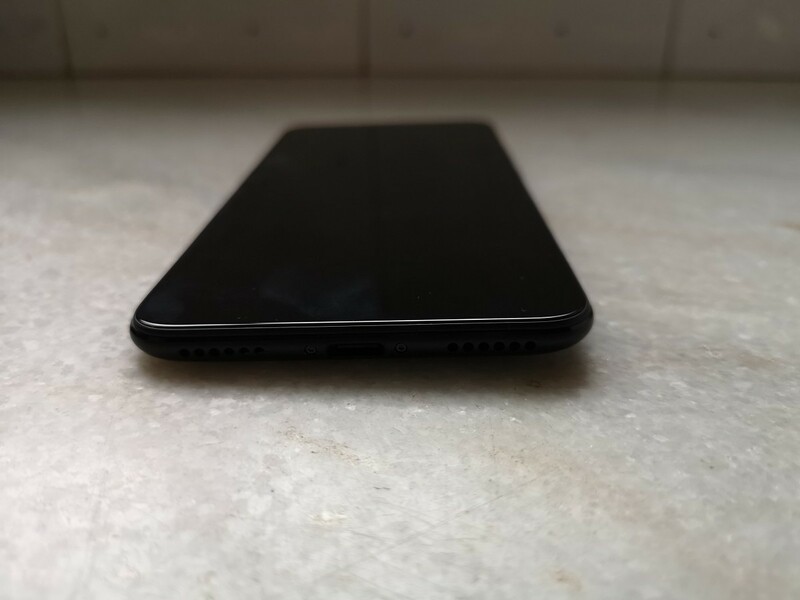 The phone is 7.3mm thick, but in reality, the curved back and the curved sides ensure that it has significantly thinner sides. This has a positive effect on usability and in-hand feel. The weight is also not an issue at 166 grams. Users accustomed to dealing with 5.5-inch (16:9) to 6-inch (18:9) devices should have no problems handling the Mi A2. 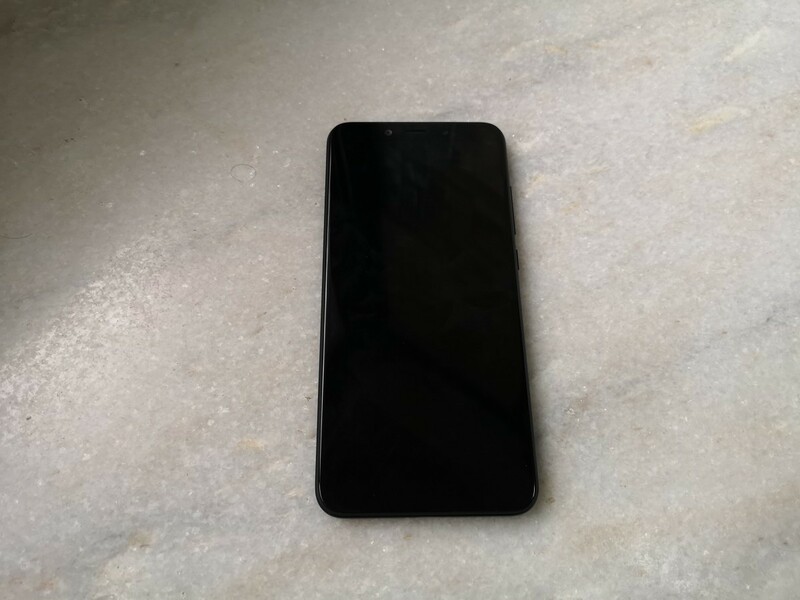 The black color variant of the Mi A2 looks and feels phenomenal. Build quality is a legitimate advantage over the competition in this price range, and small details like the fingerprint-resistant back coating and the curved nature of the design are good to see. In terms of features, Xiaomi continues to skip on providing an IP rating for water resistance. None of the company’s flagship phones feature an IP rating, so the Mi A2 isn’t alone here, but the addition of certified water resistance (with an IP67 or better rating) would have been a useful feature in broad cases. In the box, Xiaomi bundles a dark transparent glossy TPU case and a 3.5mm-to-USB-C adapter. Unfortunately, there is no fast charger included in the box, as the bundled charger only supports standard 5V/2A (10W) charging. The Mi A2 does support quick charging via a third-party adapter, and we’ll discuss this in the appropriate section later. The Xiaomi Mi A2 has a 5.99-inch Full HD+ (2160×1080) IPS LCD with an 18:9 aspect ratio. Due to the absence of a notch, discussing screen area is relatively simple. The display’s dimensions are 136 mm x 68 mm, which means that it’s significantly taller than a traditional 5.5-inch 16:9 display while having the same width. The display has Gorilla Glass 5 protection, making it the first Xiaomi mid-range phone to have that particular Gorilla Glass version (which has since been succeeded by Gorilla Glass 6). The company does not pre-install a plastic screen protector on the display. To evaluate smartphone displays, it is necessary to assess their resolution, brightness, black levels (contrast), viewing angles, and color accuracy. The Mi A2’s display is an excellent performer with respect to resolution. The Full HD+ (2160×1080) resolution coupled with an RGB matrix means that clarity is never an issue at normal viewing distances, and text rendering is excellent, as expected. Going with Quad HD+ resolution, therefore, would have made little effect in the real world. The display performs relatively well when it comes to brightness. Maximum brightness of the Mi A2’s display is in the range of 400-450 nits. 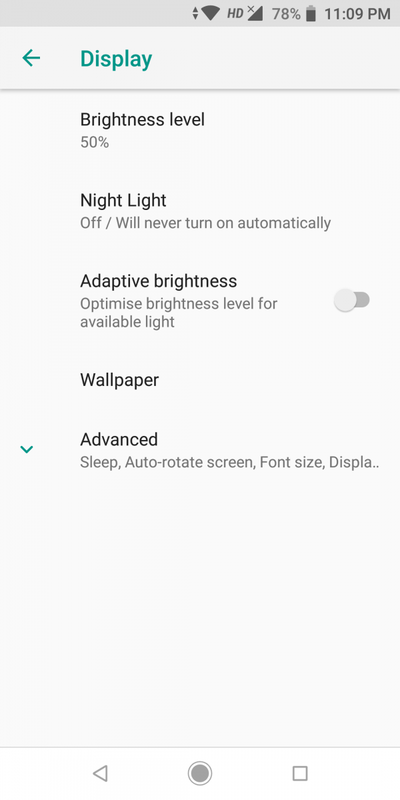 It doesn’t have a high brightness mode (HBM) for use in sunlight. Sunlight legibility is still fine in most cases thanks to relatively low reflectivity, but this is an area where users can spend more on higher-end phones and get a better user experience. Subjectively, black levels are good. 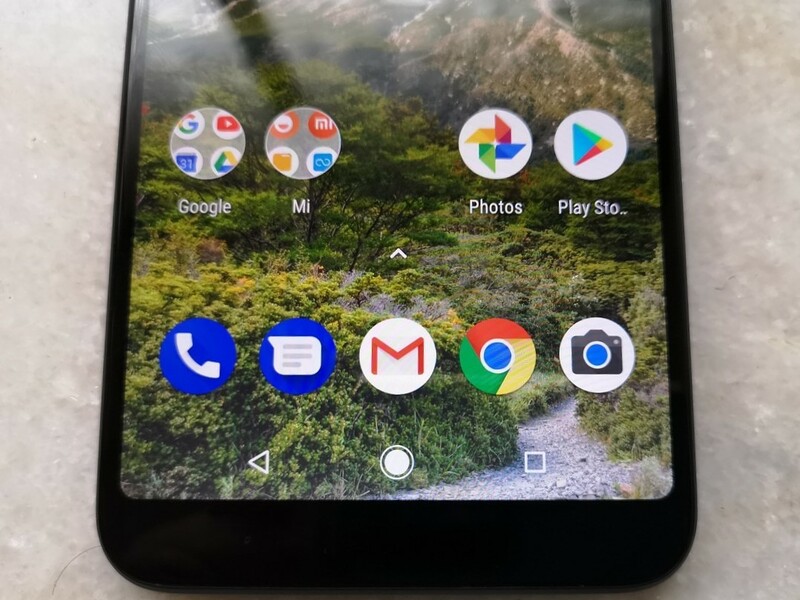 The display of the Mi A2 can’t get close to OLED displays in this respect, but the contrast ratio is still respectable. Moving on to viewing angles, the Mi A2 excels here as the display doesn’t suffer significantly from an angular color shift. This is to say that it’s still present, but the percentage of the color shift is low enough for it not to be an issue. On the other hand, significant brightness degradation is observed even at relatively small changes in angles. 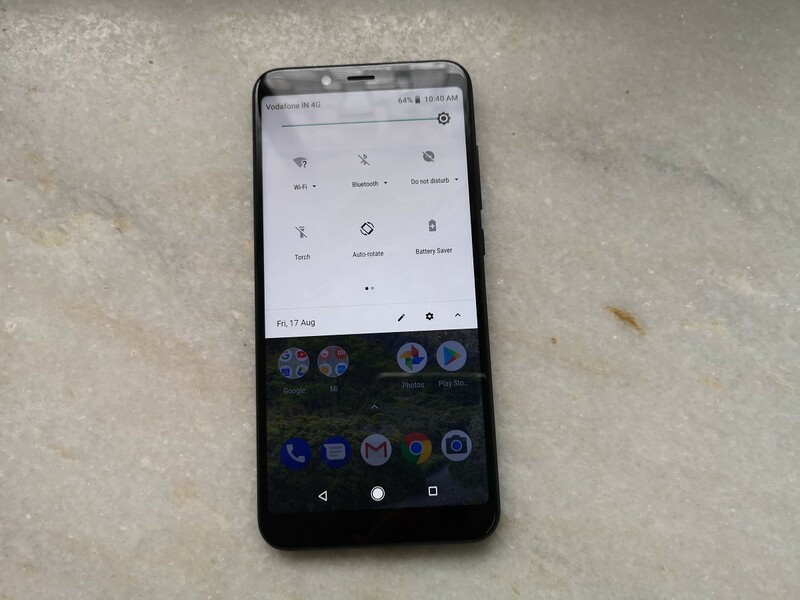 This is normal for most mid-range and even flagship LCDs, and the Mi A2 performs on par for the course here. The last part of the display quality equation is color accuracy. The Mi A2 doesn’t support Android 8.1 Oreo’s color management system. Ironically, its display isn’t adversely affected by this unlike flagship smartphone displays, which have wide color gamuts. The Mi A2’s display covers the sRGB gamut and not a wider gamut such as DCI-P3. In the Mi A2, Xiaomi doesn’t provide color profiles or even any way to adjust the color temperature. In this respect, the phone is inferior to MIUI-powered Xiaomi devices, which have different color modes for accurate or saturated colors. The display is not calibrated to the sRGB gamut. Out of the box, color temperature is visibly colder than 6504K, giving the display a distracting bluish tone. Grayscale is noticeably inaccurate as grays have a pink tint. This pink tint issue was also found on older Xiaomi phones such as the Xiaomi Redmi Note 3 and the Xiaomi Redmi Note 4. 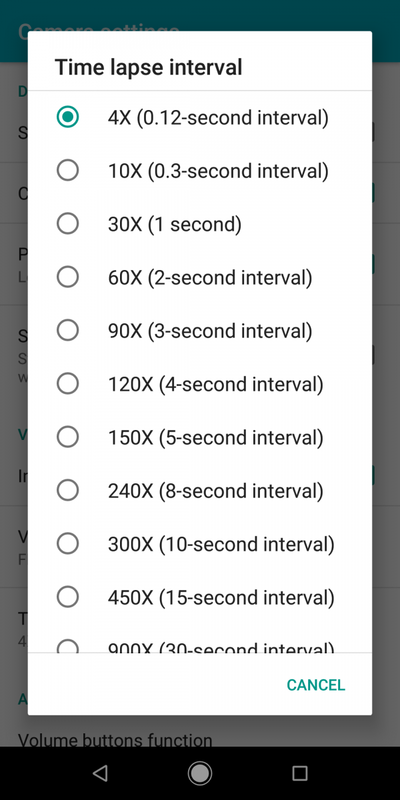 In terms of saturation accuracy, the Mi A2’s display will have deviations from the target colors, but this is difficult to test without objective measurements. In the real world, the lack of color accuracy isn’t especially noticeable. This is because the Mi A2’s display is still an sRGB display and not a wide-gamut one, which means that colors lack the oversaturated look that results from the lack of color management in the default screen modes of smartphones with OLED displays. However, it should be noted that colors are still inaccurate, and this can be observed when placing the display side by side with a reference calibrated sRGB display. (In day-to-day use, most users should have minimal issues unless they compare the display with a calibrated display.) In Developer Options, there is a picture color mode for using sRGB, but it does absolutely nothing. Unfortunately, this means that the Mi A2 has no way to provide accurate colors. Even phones such as the Redmi Note 5 Pro have modes to provide accurate colors, but the Mi A2 is lacking in this respect. Overall, the display of the Xiaomi Mi A2 is good without being excellent. Its best attributes include excellent clarity thanks to the RGB matrix IPS LCD, relatively high brightness, high contrast, and low color shift across viewing angles. On the other hand, its negatives include the lack of high brightness mode, relatively high brightness degradation across viewing angles, and the lack of calibrated color modes. At this price range, the display will likely be good enough, but I can’t help but wonder how much better the display would have been if it only had a working and calibrated sRGB mode. Notched displays are already arriving in the lower mid-range, but for better or worse, the Mi A2 isn’t part of this equation. However, it seems likely that Xiaomi will soon adopt the notch for all of its products, as the budget Mi A2 Lite and the flagship Poco F1 both have notched displays. The Xiaomi Mi A2 is powered by the Qualcomm Snapdragon 660 system-on-chip. This particular SoC has four “Kryo 260 Performance” (Arm Cortex-A73) cores clocked at 2.2GHz, and four “Kryo 260 Efficiency” (Arm Cortex-A53) cores are clocked at 1.8GHz. The cores are paired with the Adreno 512 GPU. The Snapdragon 660 is manufactured on a 14nm process. It was announced back in May 2017, but up until now, we have only seen it be used by upper mid-range phones such as the Nokia 7 Plus, Vivo X21, Oppo R15 Pro, Xiaomi Mi Note 3, etc. The Mi A2 is the first phone to be powered by the Snapdragon 660 at a price point of less than $250. In terms of CPU performance, the Snapdragon 660 can be thought of as the Snapdragon 835’s little brother. It has the same CPU clusters of Arm Cortex-A73 and Cortex-A53 cores, although it’s fabricated on a 14mm process instead of a 10nm process. The big Cortex-A73 cluster is also clocked at 2.2GHz, down from the 2.36GHz/2.45GHz max clock speed of the Cortex-A73 cluster of the Snapdragon 835. Nevertheless, CPU performance should be quite respectable, especially for the price. The GPU is a different story. The pace of improvement in Qualcomm’s mid-range GPUs has not been matching the pace of improvement of its mid-range CPUs. At the time of announcement, the Adreno 512 GPU was better than previous mid-range Adreno GPUs, but in terms of performance, it falls noticeably below the Snapdragon 820’s Adreno 530 GPU, as we will see below in the benchmarks. It even fails to match the Snapdragon 810’s Adreno 430 GPU. The Snapdragon 660 fits above the Snapdragon 636 in Qualcomm’s SoC lineup, and below the Snapdragon 835. Recently, Qualcomm announced the Snapdragon 670, which is intended to be the successor to the Snapdragon 660. It’s also worth noting that the Snapdragon 670 shares many similarities with the slightly higher-end Snapdragon 710, which is found in the Xiaomi Mi 8 SE—a phone which costs the equivalent of $280 in China. The Snapdragon 670 moves to two Kryo 360 Gold cores (semi-custom Cortex-A75) and six Kryo 360 Silver (semi-custom Cortex-A55) cores. Benchmarks show that it has faster single-threaded performance than the Snapdragon 660, but multi-core performance remains the same due to the switch to two instead of four performance cores. The Adreno 615 GPU is also 30% faster than the Adreno 512. In Geekbench, the Mi A2’s single-threaded performance is below the Snapdragon 835 and the Kirin 970, as expected. In the multi-core test, the Mi A2 beats Snapdragon 820/821 devices by a fair amount but falls below the Snapdragon 835 and the Kirin 970. The multi-core score is also noticeably lower than what other Snapdragon 660 devices have been capable of; a score of 5500+ has been the average for this SoC. The Mi A2 shines in PCMark. PCMark is a holistic system performance benchmark that tests performance across real-world scenarios, and the overall score is better than Snapdragon 636 devices. It falls noticeably behind some Snapdragon 835 / Kirin 970 phones, though. Finally, the Mi A2’s web performance is on par for the course in Speedometer. Most phones are separated by very small margins in this test, although the Snapdragon 845 does have a big performance jump over its predecessors. Overall, the Snapdragon 660 performs well in CPU and system performance benchmarks. It can even beat the 2016 Snapdragon 820/Snapdragon 821 on several occasions. Although it falls behind the Snapdragon 835, the CPU performance on offer is still better than something like the Snapdragon 636. The real cause for worry for Xiaomi is that the CPU can’t match the Kirin 970, which now powers phones such as the Honor Play. The Honor Play costs ₹3,000 / €80 more than the Mi A2 in India and Europe respectively. It should also be apparent without saying, but the Snapdragon 660 is no match for the Snapdragon 845, which is a flagship SoC in every respect. This is not an apples-to-apples comparison and one that we would normally not have made, but the arrival of Xiaomi’s own Poco F1 at the $300 price point changes the equation entirely for buyers in this price segment. To put it simply: the Mi A2’s system performance is good, but there are faster phones out there at slightly higher price points. The Mi A2’s UI performance is very good. 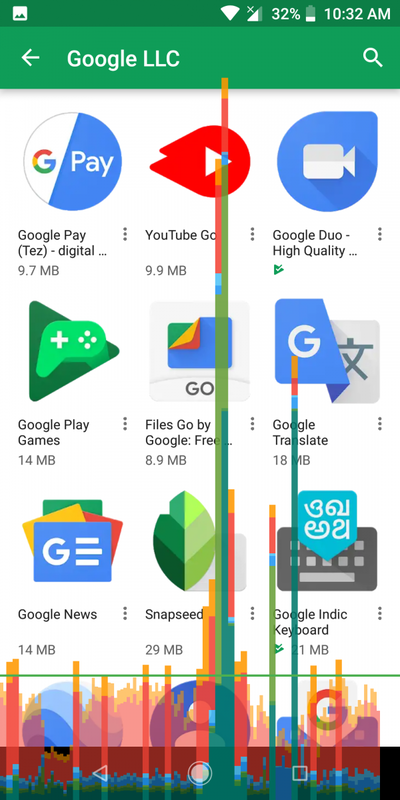 Scrolling smoothness is actually better than I expected, as the phone is able to do tasks such as scrolling through the Play Store app listing page and navigate around Google Maps without showing noticeable jank (stutter). Frame drops can still be observed in the GPU profiling bars below, but for the most part, scrolling is perceptibly smooth. The aforementioned tasks are some of the worst offenders when it comes to smoothness in Android, and the Mi A2 passes the test. Scrolling through heavy web pages in Google Chrome also presents minimal issues. 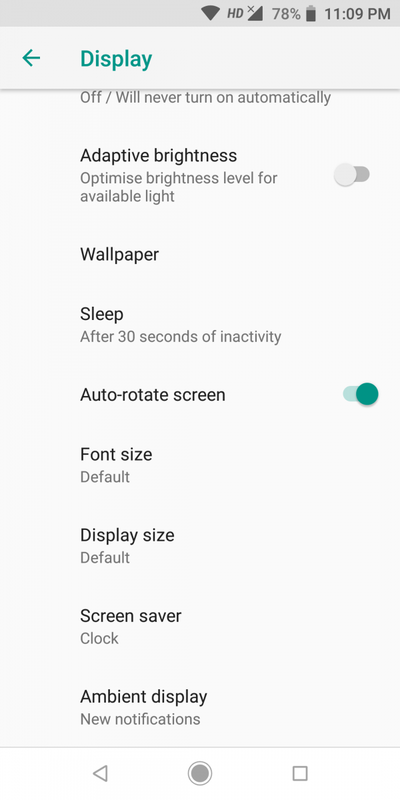 The system UI doesn’t drop many frames, which is good to see and which speaks volumes about how Android doesn’t need top-of-the-line hardware anymore. Is it as smooth as a Google Pixel 2? Not at all, but it doesn’t have to be. Relative to its price range, the Mi A2 doesn’t stand out in this respect as most Snapdragon 636-powered phones are also able to perform smoothly. Buyers would have to jump up to an Honor Play or a Xiaomi Poco F1 to observe any noticeable improvement in smoothness. With respect to app launch times, the Mi A2 performs admirably. It’s better than Snapdragon 636 phones in this respect. However, it’s not going to match a Kirin 970-powered or Snapdragon 835-powered device, and the difference will be noticeable in the real world as well. This is because app launch times are a function of multiple factors including storage speed, where the Mi A2 doesn’t perform so well (as we will see below). As an aside, Snapdragon 845-powered devices are in a different league here. Like the Snapdragon 835 and other flagship Snapdragon SoCs, the Snapdragon 660 boosts all CPU cores to max frequency upon an app launch to help boost app launch times. In terms of unlocking speed, the Mi A2’s fingerprint sensor is extremely quick and accurate. Xiaomi has been using fast and accurate fingerprint sensors in its phones since quite a while now, and the Mi A2 doesn’t buck the trend. The fingerprint sensor is good enough to be compared with phones such as the OnePlus 5T, which means that it’s one of the fastest fingerprint sensors out there. The Mi A2 doesn’t have its own face unlock, and the only option for face unlock is to use Google’s stock Trusted Face in Smart Lock. 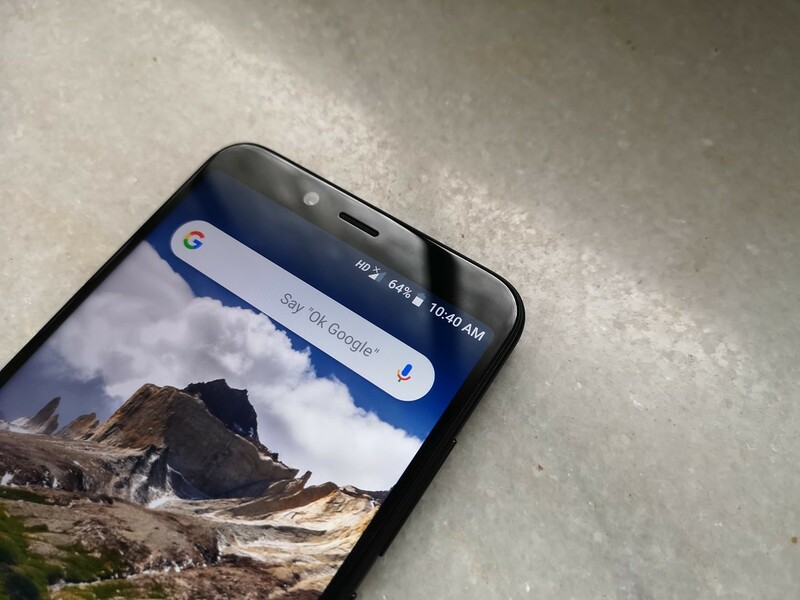 As Trusted Face is not as advanced as solutions from the likes of OnePlus, Huawei, Oppo, Asus, and even Xiaomi itself, this means that the Mi A2 does fall behind its competitors if facial recognition is a priority (users have to swipe the lock screen to unlock the phone in the event of successful recognition). Due to the speed and accuracy of the fingerprint sensor, however, I didn’t find the lack of customized face unlock to be a major issue. It would still be nice to see, though. Overall, the Xiaomi Mi A2 doesn’t disappoint in terms of real-world performance. 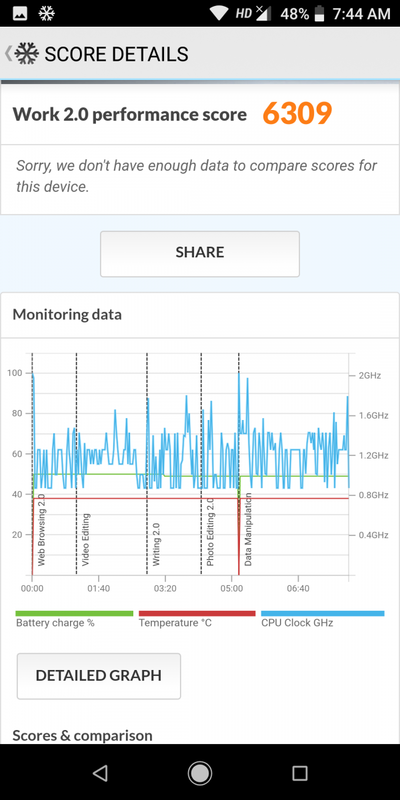 The Snapdragon 660 is more than capable to drive the Android system UI with no clear dropped frames most of the time, and third-party apps show very few stutters as well. Thermals are also good. The Mi A2’s temperatures are within an acceptable range, and the phone rarely gets hot. 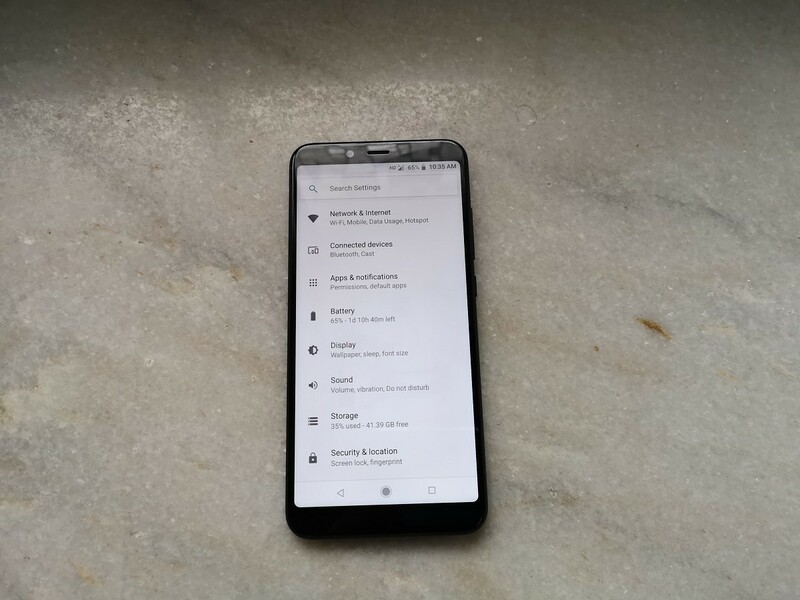 In India, the Xiaomi Mi A2 is available for now only in a single 4GB RAM/64GB storage variant, and that’s what we are testing. The 4GB of LPDDR4X RAM is on the lower side for flagships today, but it should be adequate for lower mid-range phones. Flagship phones such as the Samsung Galaxy S9 and the upcoming Google Pixel 3 still have only 4GB of RAM, and therefore, the user experience on the Mi A2 should still be good for the most part. In my testing, I didn’t have any issue with the Mi A2’s RAM management. 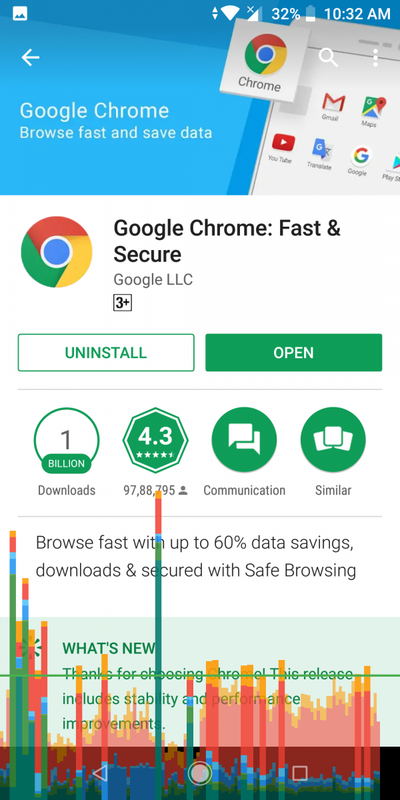 Apps, tabs, and services remain in memory for a long period of time, and the phone is able to retain more than 20 Google Chrome tabs in memory at the same time. There are no re-draws, and for the most part, the memory management is fine. Would 6GB of RAM have been an improvement? Yes, but that doesn’t mean 4GB RAM devices are unusable. It should be noted that the difference becomes visible in heavy multitasking and gaming. In simple terms, the number of apps and services that the Mi A2 is able to hold in memory is less than the number of apps and services most 6GB RAM devices are able to hold. This is an area where the Mi A2 doesn’t provide the most value. The Redmi Note 5 Pro’s 6GB RAM/64GB storage variant is available for the same price as the Mi A2’s 4GB RAM/64GB storage variant in India. Other phones such as the Asus ZenFone Max Pro M1 also have 6GB RAM variants that are priced significantly lower than the Mi A2’s upcoming 6GB RAM variant. There is also the looming shadow of the Poco F1, which has 6GB of RAM in its base variant. The Snapdragon 660’s Adreno 512 GPU isn’t a powerhouse. It’s a significant upgrade over the Adreno 509 GPU of the Snapdragon 636, but it fails to match current Adreno GPUs in the Snapdragon 8xx series. Therefore, the Mi A2’s peak GPU performance can’t match even 2015 flagship phones. 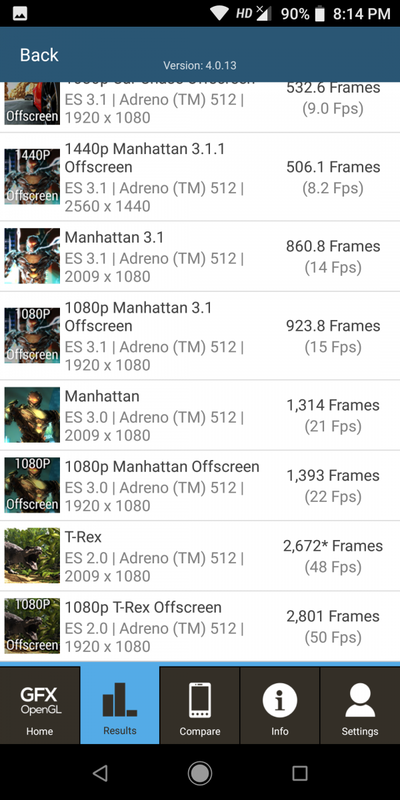 The Snapdragon 820/821’s Adreno 530 GPU is significantly better. Also, the Snapdragon 835’s Adreno 540 GPU is 142% faster than the Adreno 512 GPU in benchmarks. This has an impact on high-end games. 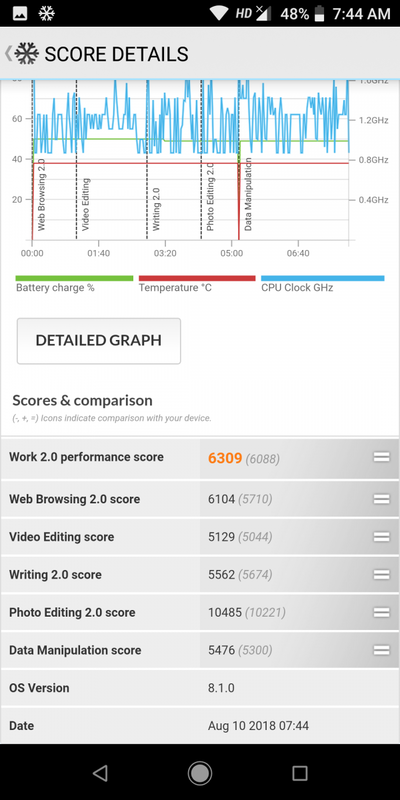 Comparing to other vendors, the Adreno 512 GPU is better than the Mali-G72MP3 of the MediaTek Helio P60. However, it fails to match the Mali-T760MP8 of the Exynos 7420 and the Mali-T880MP12 in the Exynos 8890, to say nothing of the Mali-G71MP20 in the Exynos 8895 and the Mali-G72MP18 in the Exynos 9810. The story is similar when comparing to HiSilicon’s GPUs: the Mali-G71MP8 in the Kirin 960 and the Mali-G72MP12 in the Kirin 970 are both faster with respect to peak performance. 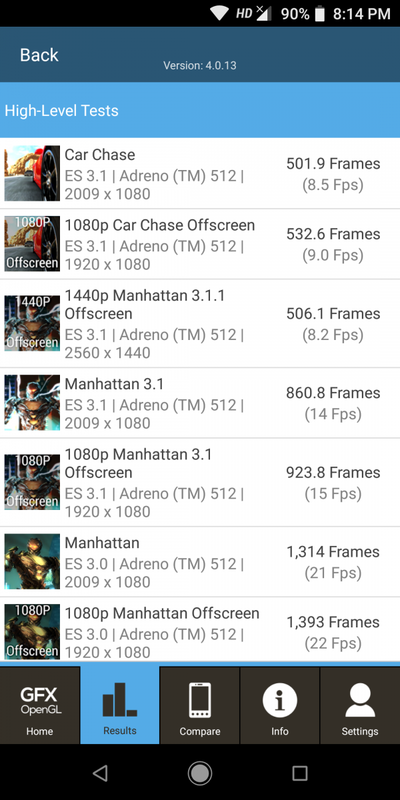 The Mi A2’s benchmark results in GFXBench and 3DMark are noted below, along with the results of a Qualcomm Snapdragon 835 device for comparison. The Xiaomi Mi A2’s GPU performance falls noticeably behind that of the Snapdragon 835. (The Snapdragon 835’s Adreno 540 GPU is also faster than the Mali-G72MP12 GPU of the Kirin 970.) The gap between Qualcomm’s flagship and mid-range GPUs is only growing, to the extent where the Xiaomi Poco F1’s Adreno 630 GPU featured in the Snapdragon 845 is 3x (200%) faster than the Adreno 512 in the Snapdragon 660. Ultimately, the Mi A2 won’t be a gaming champion. Most popular games will run well at Medium or High settings, but the latest high-end games will run either at low settings or will not run at all. Users interested in light gaming should be fine with the Mi A2, but users interested in heavy 3D gaming should probably step up to the Snapdragon 845-powered Poco F1. The Mi A2’s storage performance is okay. It’s slightly better than phones such as the Asus ZenFone Max Pro M1, but when compared to phones like the Honor Play or the Xiaomi Poco F1, the Mi A2 falls behind by a significant percentage. The difference is visible in sequential reads as well as random reads and writes. In the real world, however, most users will find it difficult to complain about the storage performance unless they are comparing it side-by-side to a UFS 2.1-powered flagship device. In what has become a recurring theme, the Mi A2’s performance is best in its particular segment, but with the close proximity of affordable flagships, it’s not the absolute best by a long shot. Traditionally, one of the biggest weak points of Xiaomi phones has been their cameras. Xiaomi has tended to lag behind in image processing, and the problem affected budget phones as well as flagship phones. Having used the Xiaomi Redmi Note 3 as my primary phone for a year, Xiaomi’s camera weaknesses were well-familiar to me. The situation didn’t get much better for Xiaomi’s budget and lower mid-range phones in 2017 as phones such as the Redmi Note 4 had similarly disappointing cameras, although the Mi A1 did represent a significant step forward. This year, though, has been a new beginning when it comes to Xiaomi smartphone cameras. The Redmi Note 5 Pro was acclaimed for having good image quality with its dual 12MP + 5MP rear camera setup. The improvement in image quality showed across phones such as the budget Xiaomi Redmi S2/Redmi Y2, and it was apparent in Xiaomi’s flagship phones as well. The Xiaomi Mi Mix 2S and the Xiaomi Mi 8 both have very good cameras, and so, it was fair to expect camera performance improvements to be brought over to the successor of the Mi A1. With the Xiaomi Mi A2, Xiaomi has done that. The company is heavily promoting the Mi A2’s dual rear camera setup, to the extent of comparing it with the OnePlus 6 and the iPhone X. It was something which they did last year too, and once again, as we will see in the image quality assessment section, the company did overplay the improvements in quality. The Mi A2’s camera is definitely good, but comparing it with the OnePlus 6 and the iPhone X is not a fair comparison to make, as it just doesn’t stand up to those “competitors” (and nor does it have to). The Mi A2 has a 12MP primary rear camera with a Sony IMX486 sensor, 1.25μm pixels, f/1.8 aperture, phase detection autofocus (PDAF), and 4.07mm focal length (22.4mm focal length in 35mm equivalent terms). The camera does not have optical image stabilization (OIS). The 12MP camera is paired with a 20MP secondary camera with a Sony IMX376K sensor, 1.0μm pixels, and f/1.8 aperture. The Mi A2 has a dual LED flash, and it features electronic image stabilization (EIS) for video recording. The role of the secondary camera: The Mi A1 had a secondary camera with a 56mm telephoto lens. This was used for 2x optical zoom as well as for Xiaomi’s implementation of portrait mode. With the Mi A2, Xiaomi has dropped the telephoto lens in favor of a low-light focused secondary camera. The secondary camera has the same focal length as the primary camera, which means that 2x optical zoom is no longer offered with the Mi A2. Zooming beyond 1x now results in digital zoom. Digital zoom comes with its usual image quality degradation trade-off. Some may think that the Mi A2’s lack of a telephoto lens is a downgrade, but Xiaomi has other ideas. The secondary camera is meant to help in low-light scenarios. This idea isn’t new—we have seen it be employed by the likes of OnePlus with the OnePlus 5T, OPPO with the OPPO R15, and others. However, the implementation matters more than the theory. The Mi A2’s secondary 20MP camera uses pixel binning to combine four pixels into a single pixel. It’s not as simple as it sounds, though. In Photo (auto) mode, the Mi A2 combines the output of both cameras and merges them into a single, better photo. 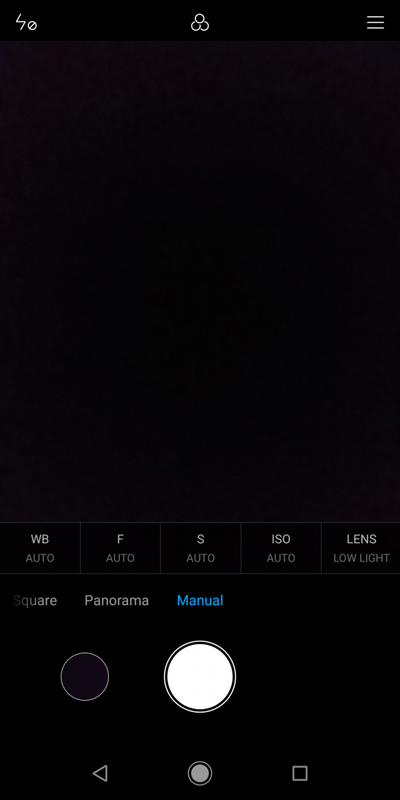 In Manual mode, Xiaomi interestingly provides an option to use the Regular lens or the Low-Light lens. Using the Low-Light option results in photos that aren’t on par with photos taken in Photo mode in terms of detail, while the Regular Lens option results in dark, noisy photos. This proves that in Photo mode, the camera isn’t using only the 20MP secondary camera. Instead, both cameras are used to take a better photo, and the difference in image quality is noticeable. The use of the Sony IMX486 sensor for the primary camera is an interesting decision. 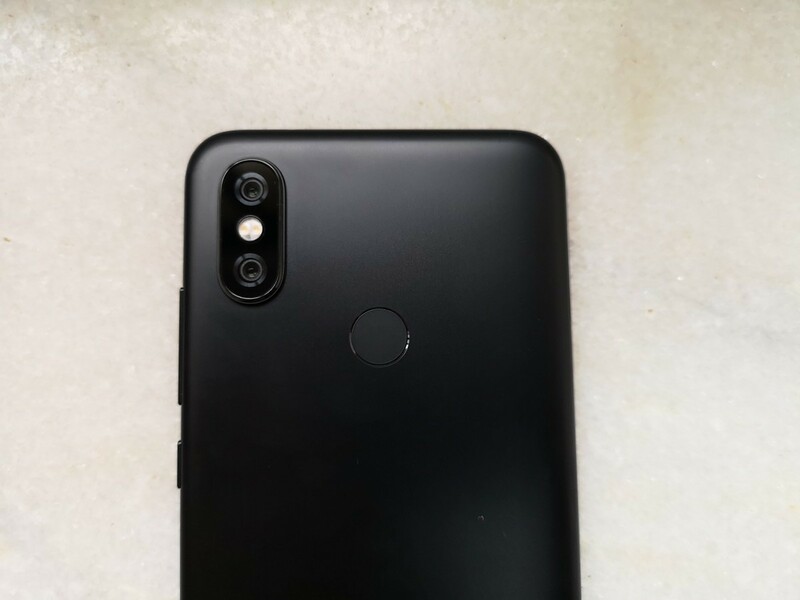 The Xiaomi Redmi Note 5 AI Dual Camera (which is sold in Europe and China) uses a bigger sensor with 1.4μm pixels, and the Poco F1 also uses a similar sensor. The Mi A2 goes back to the Redmi Note 5 Pro’s smaller sensor, with smaller 1.25μm pixels. It does have a brighter f/1.8 aperture, which negates some of the differences. Ultimately, we don’t know why Xiaomi didn’t go with the bigger sensor which would, all other aspects remaining constant, have provided an image quality advantage in low light. It’s not surprising to see the lack of OIS at this price range. Including it would have undoubtedly helped in low light photos as well as in video recording, but the Mi A2 employs other means in an effort to reach the same goal (namely, pixel binning for better photos in low light and EIS for stabilized videos). The Mi A2’s camera doesn’t fully support the Camera2 API like older Xiaomi devices. This means that Google Camera ports will not work without changing the build.prop—which requires root. 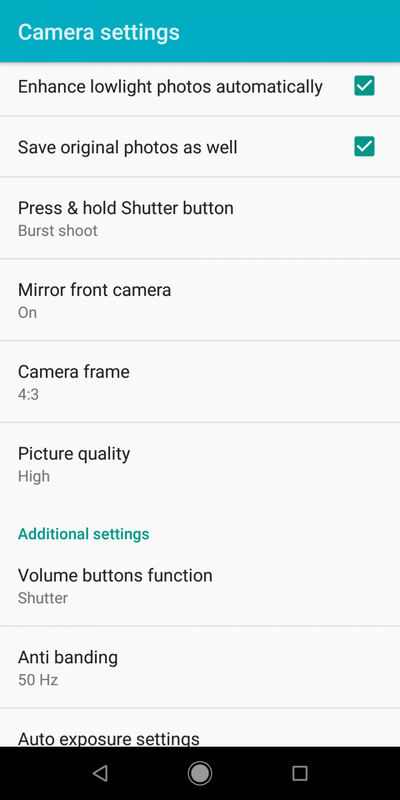 The Xiaomi Mi A2 uses Xiaomi’s own Camera app instead of the AOSP camera app. Lifted from MIUI, the Camera app has come a long way in terms of features, and it’s mostly pleasant to use on the Mi A2. 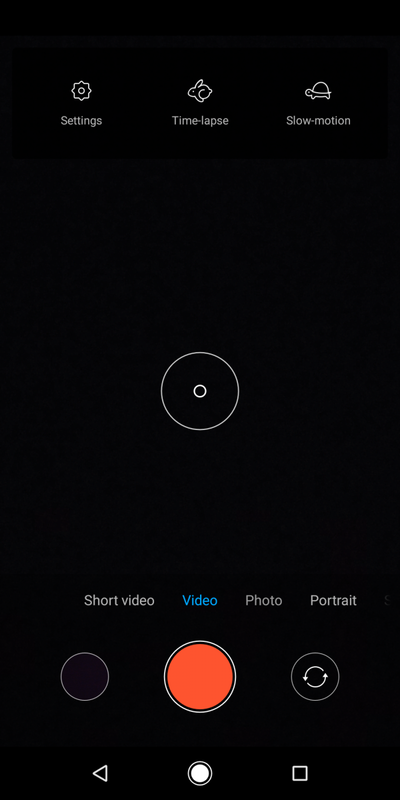 Three buttons are visible on the bottom of the camera UI: shutter key, front-facing camera switch, and a shortcut to view photos in Google Photos (which is the gallery of choice in the Mi A2). On the top of the camera UI, we get an option to toggle the LED flash, toggle HDR (Auto/On/Off), filter button, and the menu button. 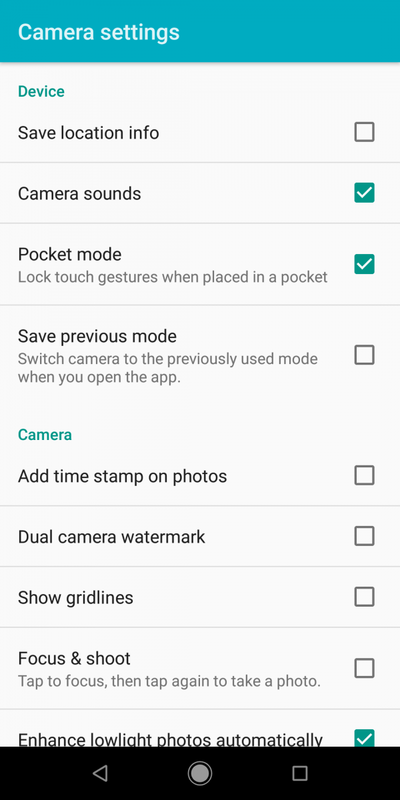 The menu button contains options such as Timer, Straighten, Group selfie, HHT, and more. 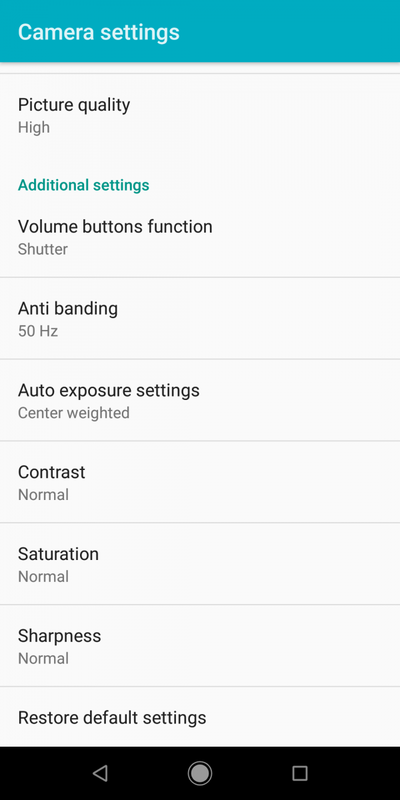 It should be noted that the Mi A2 comes with HDR set to Auto by default. While Auto HDR is normally a good feature, it can lead to problems with the camera user experience and image quality in low light on the Mi A2. We will go into more detail later on. The camera modes are: Photo, Video, Short video, Portrait, Square, Panorama, and Manual. The Photo mode is the default mode that acts as an auto mode, while the Portrait mode is intended to get the bokeh effect. The Portrait mode informs users to make sure that the object isn’t further than 2 meters. 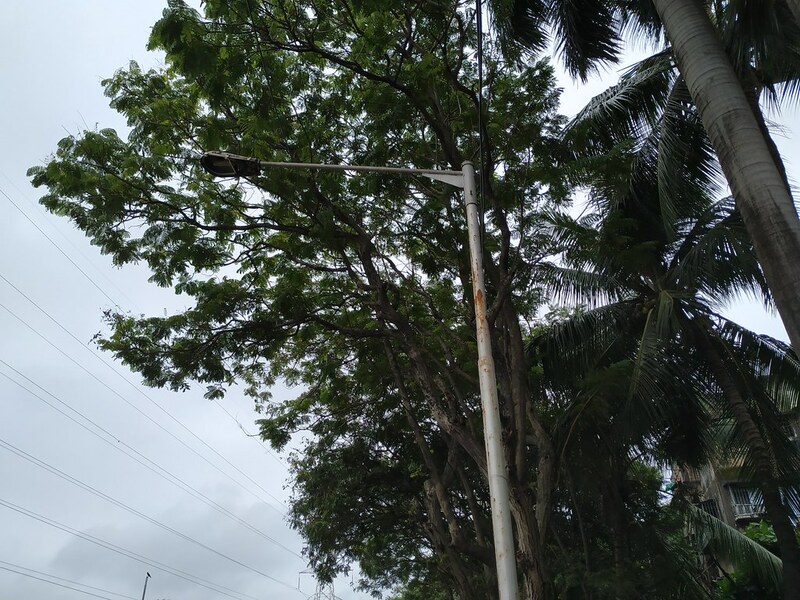 The Manual mode is a full-featured implementation on the Mi A2, and it’s another point of differentiation against Redmi phones. It has options for white balance, focus distance, shutter speed (up to 32 seconds), and ISO (up to ISO 3200). As mentioned previously, it even allows users to choose either the regular lens or the low-light lens. However, users should stick to the default Photo mode in low-light, because there is no way to combine the output of both cameras in Manual mode. The camera takes photos in 12MP (4000×3000) resolution at 4:3 aspect ratio by default. Users can change the image aspect ratio to 16:9 or 18:9. The HHT (Handheld Twilight) mode takes multiple photos sequentially and aligns them to create a single brighter image. The intent is to take sharper photos without needing a tripod, but unfortunately, the Mi A2’s lack of OIS means that most photos taken with HHT mode are blurry due to the need to hold the phone steady for multiple seconds. In the Settings menu, the “Enhance low-light photos automatically” option is ticked on by default, but its exact workflow remains opaque. For the most part, the Mi A2’s phase detection autofocus (PDAF) helps it focus quickly and take photos with minimal shutter lag. Photos taken without HDR have no shutter lag in daylight. HDR photos do have significant shutter lag, which increases the chances of camera shake and motion blur. In low light, the camera prefers to activate HDR far too often, which has a negative impact on both the camera user experience as well as image quality. The use of HDR means that it can take two seconds to take a photo, and with the lack of OIS, this predominantly results in blurred photos which don’t have any detail. Manually switching off HDR does improve the user experience significantly as the camera is then able to take photos much faster. The use of AI for scene recognition behind-the-scenes is also not apparent to the user as the MIUI Camera app doesn’t display the names of recognized scenes. This is probably a good thing as it lets the app’s user experience remain simple. The camera preview has a high frame rate even in low-light. On the other hand, the preview’s resolution is not as high as it should be, which can lead to minor issues with framing in low-light conditions. Overall, the Auto HDR issue in low light is the only serious problem in the camera’s user experience, as it affects image quality. Other aspects are mostly handled well. Methodology: All photos were taken handheld in Photo mode. Daylight photos were taken with HDR set to Auto. Some daylight samples, therefore, made use of HDR, whereas others did not employ it. 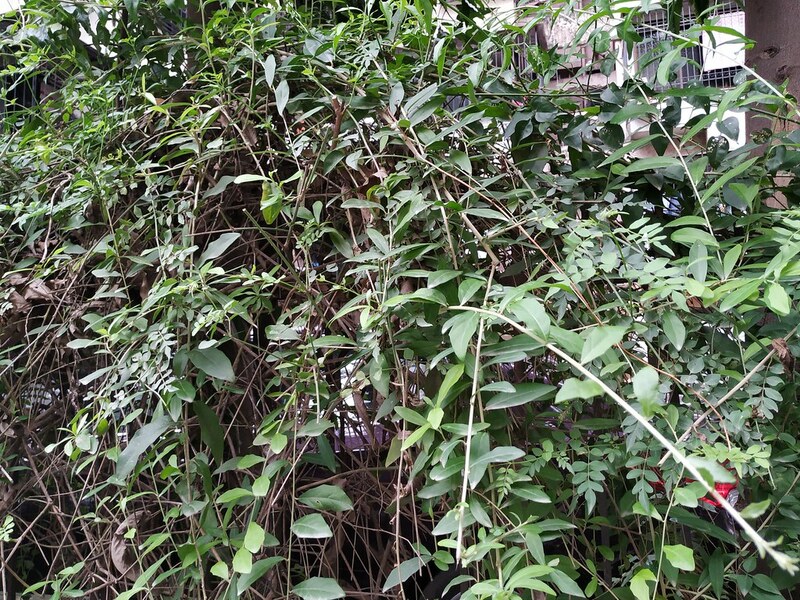 In low light, most samples were taken specifically with HDR switched off, as HDR Auto has a detrimental effect on image quality in such conditions on the Mi A2. The image galleries have been uploaded to Flickr in order to preserve the full resolution of the image samples. To analyze image quality, we recommend opening each photo in a separate browser tab and zooming to the actual size of the photo, as many observations are difficult to note at downscaled web resolution sizes. Click the left and right arrow buttons to navigate photos. Key aspects to observe in the image samples are exposure, detail, and dynamic range. In daylight, the Xiaomi Mi A2 performs well. Exposure is mostly on point in most scenes, although underexposure does become an issue in high-contrast challenging scenes. Colors are also reasonably accurate, with no obvious oversaturation. In terms of detail, the 12MP photos are average. The camera captures a lot more detail than previous Xiaomi budget devices, but it understandably falls below flagship cameras. On the negative side, the noise reduction used is still too heavy-handed, which means that detail in trees, plants, grass, etc, can end up being degraded. The dreaded oil painting look appears in a few samples, although it’s worth mentioning that these daylight samples were taken in challenging monsoon conditions. Noise isn’t a big issue at base ISO, although it should be noted that the Mi A2 uses ISO 100 as the base ISO in Photo mode. Going down to ISO 50 or lower would have potentially improved noise reduction and detail preservation, and it’s a factor that Xiaomi should take a look into. In terms of dynamic range, the dual camera setup doesn’t compete with flagship cameras, but it’s still a marked improvement over most smartphone cameras in this price segment. In especially challenging scenes, the Mi A2 fails to retain shadow detail, and photos are a bit underexposed as well. HDR auto becomes very useful here as it attempts, not without success, to mitigate the dynamic range deficit to flagship phones. As far as virtues go, the camera samples don’t suffer from over-sharpening or corner softness, which means they are free from unnatural image artifacts and soft edges of the frame. However, exposure and detail aren’t too great. HDR auto also could be improved to make some samples a bit brighter. This would improve shadow detail while retaining the highlights. The one aspect where the camera falls behind is in the detail. 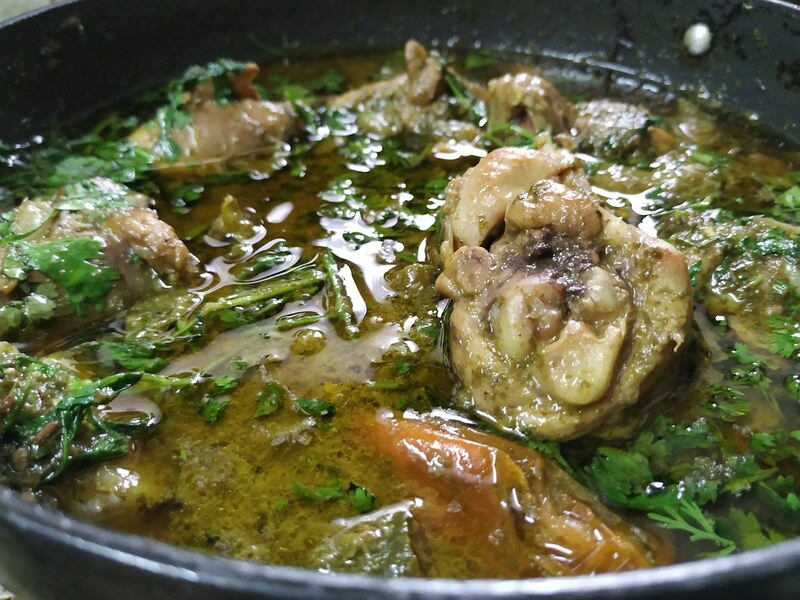 Image processing is good for the most part, but fine texture detail is lacking. Again, this is only an issue when the phone is compared with higher-priced competitors. Ultimately, the daylight camera samples are the best I have seen in this price range. In terms of comparison, the Mi A2 falls slightly below phones such as the OnePlus 3T, but it is significantly better than budget phones like the Asus ZenFone Max Pro M1. Even though 2x optical zoom is not available, 2x digital zoom is still relatively good. It’s not optimal, but thanks to the improved primary camera, the output is fairly usable in situations where zoom is required. Moving indoors, the Mi A2 runs into a few noteworthy issues, while performing admirably in general. The takeaway is the same: when compared to higher-priced phones, the camera struggles with underexposure as well as fine detail indoors. It’s still ultimately the best in its price range, but it does have room for improvement. It’s good to see that the oil painting effect is still absent in most indoor photos, and when there is enough light, the camera does a fair job. Overall, the Mi A2 can struggle with respect to indoor photography, especially in low light. It’s an area where expensive flagship phones can take demonstrably better photos, but the Mi A2 is no slouch in this respect as it performs better than some affordable flagships like the OnePlus 5T and the Honor View 10. 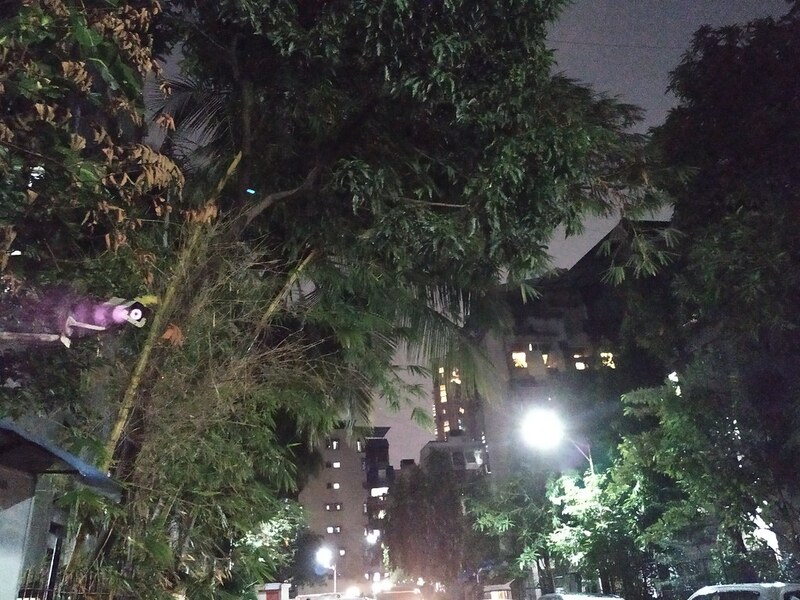 The Xiaomi Mi A2’s secondary camera is tailored for low light, and in Photo mode, photos are combined from the output of both cameras. With such emphasis being put on low light, we had naturally high expectations, and barring one major flaw, the Mi A2 mostly delivers. The low-light image samples are included in the Flickr album linked below. With HDR set to off, the Mi A2’s low-light photo samples mostly have enough light (although flagship cameras are in another league here). Detail falls off significantly, but it still manages to be equivalent or better than similarly priced phones. Low light photos are affected by a high amount of luminance noise. Regrettably, some samples are also affected by chromatic (color) noise to some extent, even when viewing the samples at downscaled web resolution. On the other hand, exposure is handled relatively well thanks to the f/1.8 aperture and pixel binning process, and few samples were affected by underexposure. Xiaomi stated that the Mi A2’s camera was on par with the OnePlus 6 and the iPhone X, but in low light, that is clearly not the case. Color accuracy is a strong point, while dynamic range remains average as shadow detail isn’t retained. Overall, though, the Mi A2 continues to distinguish itself in low light as it beats phones like the OnePlus 5T and the Honor View 10. Despite the substantial degradation in detail, the low light samples are still probably the best low light samples taken by any smartphone camera at the $250 price point. The Poco F1 will take better photos in low light at the $300 price point, but I have not had a chance to test it yet. The one major issue in low light is HDR, which is set to Auto by default. HDR has a tendency of being triggered far too often in low lighting conditions, where it shouldn’t be. Samples taken with HDR are predominantly blurred due to the lack of OIS and the high shutter lag in HDR photos. The user has to manually switch HDR off in low light in order to take good photos. However, if HDR auto is left on, the camera user experience, as well as image quality in low light, fails to impress as there is next to no detail in blurry image samples. 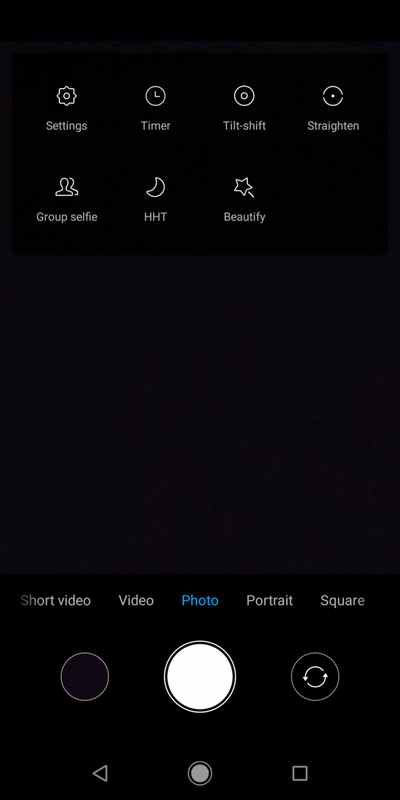 Xiaomi is advised to correct this behavior by either a) Reducing the image shutter lag in HDR photos, or by b) Reducing the trigger point for HDR in low lighting conditions. The second option seems to be a more feasible, easier solution, and improving things here would make a difference in real-world low-light scenes. The dual LED flash of the Mi A2 works well in situations where a LED flash is required. The detail in samples taken with the LED flash is good, and thanks to even illumination, exposure isn’t an issue. The pros of the Mi A2’s low-light photos include competitive detail (for the price segment), color accuracy, and exposure. The cons include a high amount of luminance noise in many samples, the presence of chromatic noise in some samples. The amount of light being captured is also relatively average. Overall, the Mi A2’s dual camera setup has good image quality. In some cases, the camera’s image quality surpasses expectations by beating higher-priced smartphone cameras, while it struggles a bit in other cases due to issues with HDR auto and the lack of OIS. With respect to its price point, it would not be an overstatement to say that the Mi A2 has probably the best camera at the $250 / €280 price point for photos. The Xiaomi Mi A2’s highest video resolution setting is 4K at 30fps. It can also record videos in 1080p at 30fps and 60fps. 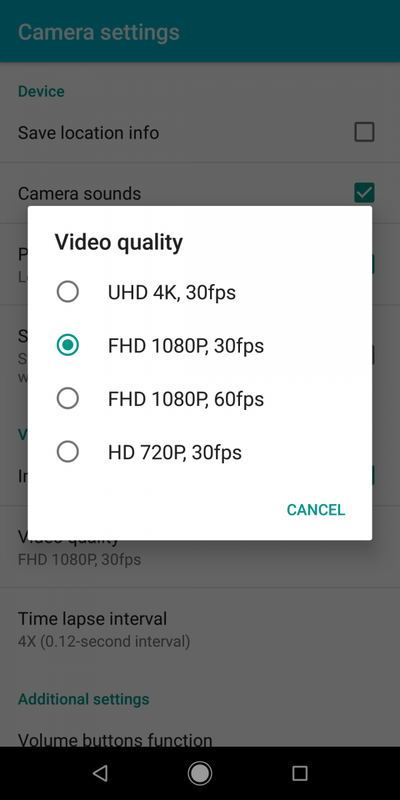 Videos are recorded in the standard H.264 codec, and Xiaomi doesn’t provide an option for recording in the newer HEVC (H.265) codec. [email protected] and [email protected] videos have a bit rate of 19-20Mbps, while 4K videos have bit rate of 40-42Mbps. Electronic image stabilization is active in [email protected] as well as [email protected] videos. Unfortunately, [email protected] videos don’t have EIS, which means they suffer from camera shake. The [email protected] videos have a competitive amount of detail in daylight, and other factors such as color accuracy, exposure, and dynamic range are on par for the course as well. The lack of EIS in 4K is disappointing as all videos containing movement are affected by camera shake. This problem isn’t specific to the Mi A2 as plenty of higher-end phones also lack EIS in 4K video recording, but this doesn’t negate the problem itself. In low light, the videos maintain the 30fps frame rate, but the detail is significantly degraded. The camera also suffers from a substantial amount of underexposure in low light—this is because of the reduction in the amount of light being captured. On the other hand, [email protected] videos do have EIS, and the difference in quality is apparent at first glance. EIS works very well on the Mi A2, as it minimizes camera shake during panning or walking. 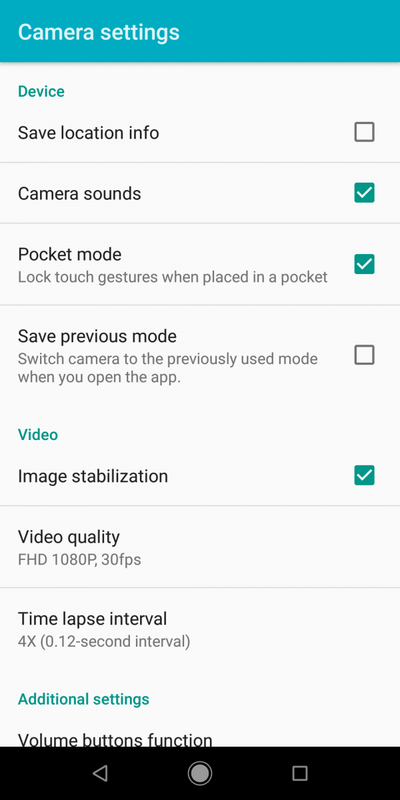 As expected, it crops the field of view, but I didn’t notice any negative impact on detail by having EIS switched on (users can switch off the “Image stabilization” option in the video settings to switch off EIS). In low light, the [email protected] videos are affected by a loss of detail and from underexposure, just like the [email protected] videos. Thanks to EIS, such videos are still usable, and the frame rate is maintained at a constant 30fps. The Mi A2 is the first Xiaomi mid-range phone to support [email protected] video recording out of the box. The phone does support EIS even in [email protected] videos. In daylight, the 60fps videos are underexposed when compared with [email protected] videos, but the smooth 60fps frame rate, competitive detail, and excellent stabilization combine to make this recording option viable in daylight. It’s a different story in low light, unfortunately. The [email protected] videos suffer from a drastic decrease in detail in low light. Underexposure also becomes a much more significant problem, to the extent where it is hard to see the content of the video. Unless the 60fps frame rate is a priority, I recommend skipping the [email protected] recording option in low light. Other video recording modes include Timelapse and Slow motion. The Mi A2 records slow motion video in 1080p resolution at 120fps. Overall, the Mi A2 retains its strengths in video recording. EIS is well implemented on both the [email protected] and [email protected] recording modes, although it would have been nice to see on the 4K recording mode as well. Detail and color accuracy are competitive, while exposure can become an issue as the light levels start reducing. Despite weaknesses such as significant underexposure and loss of detail in low-light videos, the Mi A2 once again probably has the best camera for video recording at its price point, and video recording is a genuine strength of the phone. The Xiaomi Mi A2 has a 20MP fixed-focus front-facing camera with a Sony IMX376K sensor, and f/2.2 aperture. The camera has a dedicated LED flash (instead of using a display flash). Xiaomi states that in low light, it uses pixel binning to simulate 2.0μm large pixels, but we have no way to verify this. Portrait mode is also available on the front-facing camera. In daylight, the 20MP photos are some of the best I have seen in terms of detail, exposure, and color accuracy. They easily compete with higher-priced phones. Even in low light, the natural image processing and laid-back noise reduction combine to result in excellent photos. The LED flash also works well in low lighting. The Mi A2’s mono loudspeaker gets very loud—even louder than some flagship phones. Speaker quality is also good for use cases such as phone calls and videos, and I didn’t have any major complaints here. Unfortunately, the phone doesn’t have a 3.5mm headphone jack. This makes it the first Xiaomi mid-range phone to skip on the analog port, and the decision arguably makes even less sense on this phone, especially in emerging markets. Removing the headphone jack has resulted in no obvious benefits. The phone is thick enough to feature the headphone jack. 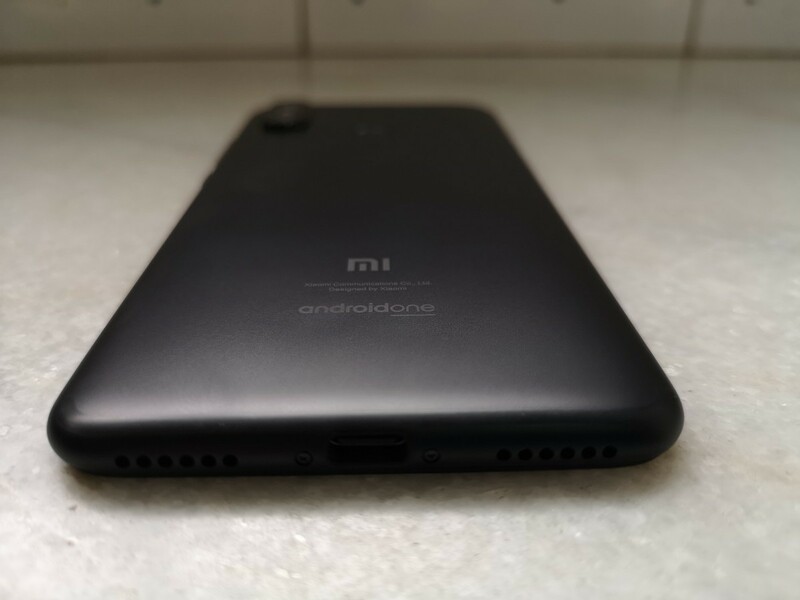 It does not have an IP rating for water resistance (this is worth mentioning here because an IP rating is easier to achieve by not having a headphone jack), and there is no increase in battery capacity from the Mi A1 (in fact, battery capacity has slightly decreased from 3,080mAh to 3,010mAh). To put it simply, the removal of the headphone jack is a straight downgrade from the Mi A1, which even had a dedicated amplifier to drive high-impedance headphones. The nascent USB Type-C ecosystem and the expensive nature of Bluetooth audio equipment mean that Xiaomi’s decision to remove the headphone jack in the Mi A2 probably won’t be popular in markets like the Indian subcontinent. This is a feature that has been taken for granted up until now by mid-range smartphone buyers, and the Mi A2 bucks the trend in a negative manner here. The lack of the headphone jack means that basic functionality that has been present in smartphones up until now has to be replaced by a separate product that can be easily misplaced. The product referred above is the 3.5mm-to-USB-C adapter. Xiaomi does bundle a 3.5mm-to-USB-C adapter in the box. Audio quality from the adapter sounds fine to me, although I’m not an audiophile. Volume is a bit lower than it should be, though, which may lead to problems with high-impedance headphones. Ultimately, it’s up to users to determine whether the lack of the 3.5mm headphone jack is a deal-breaker on the Xiaomi Mi A2. With phones such as the Honor Play and the Poco F1 both retaining the headphone jack, the Mi A2 makes its task more difficult for itself. 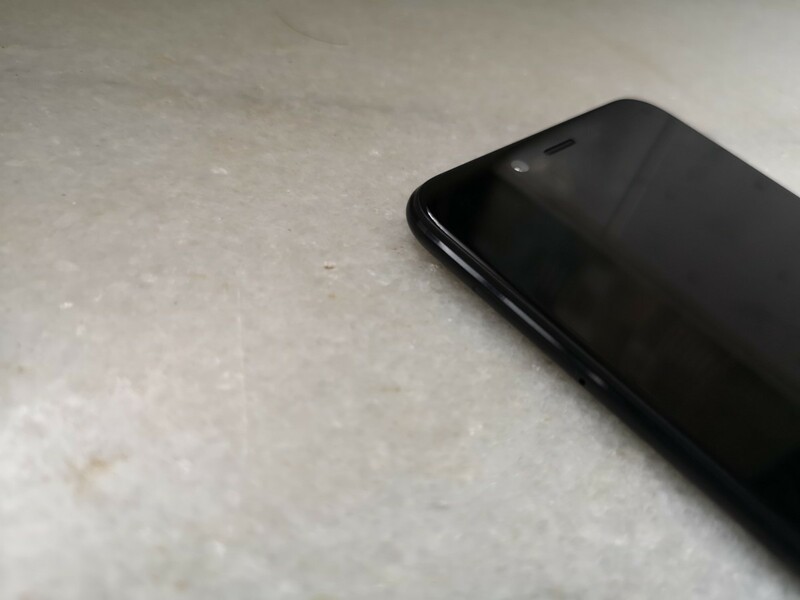 In fact, it is the only phone in the whole ₹15,000-₹25,000 price range to skip on providing the headphone jack. In my view, Xiaomi’s decision was a basic mistake that can’t be rectified now on the Mi A2. We hope that Xiaomi decides to retain the headphone jack in its other mid-range phones. The Xiaomi Mi A2 is the second Xiaomi phone to be part of the Android One program. It’s powered by nearly stock Android 8.1 Oreo, which is a completely different user experience than MIUI 9 (or the upcoming MIUI 10) on MIUI-powered Xiaomi phones. Being part of the Android One program means that Xiaomi is required to provide monthly security updates to the Mi A2. 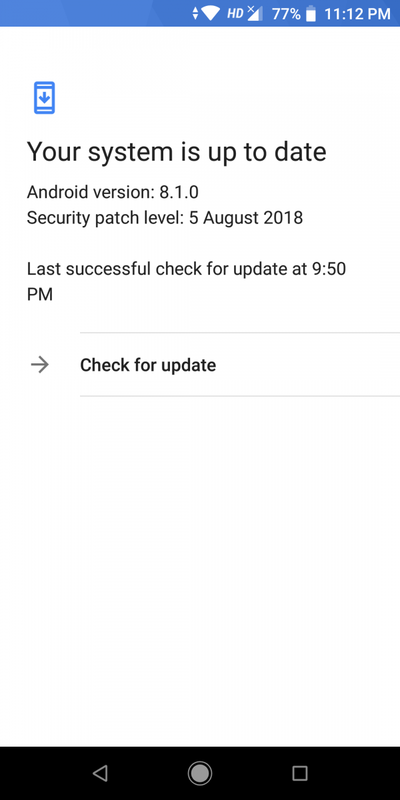 When I powered on the phone for the first time, the August security patch update was ready to install. Xiaomi has been diligent when it comes to providing security patch updates on the Mi A1, so we have reason to believe that this will a strength of the Mi A2 as well. Android version updates are another matter, though. The updates on Android One devices are handled by the device maker (in this case, Xiaomi), and not by Google. This can and has led to delays in the past. The Mi A1 launched with Android 7.1 Nougat in September 2017, and Xiaomi promised an Android Oreo update before the end of 2017. The update started rolling out on December 31, but Xiaomi had to stop the roll-out because of major bugs. The roll-out was eventually resumed in January, but then it took Xiaomi a long time to roll out the Android 8.1 update. When the roll-out started in June, the company once again had to halt it after discovering a major bug that would wipe users’ SMS history. The roll-out of that particular update was resumed a few weeks later. 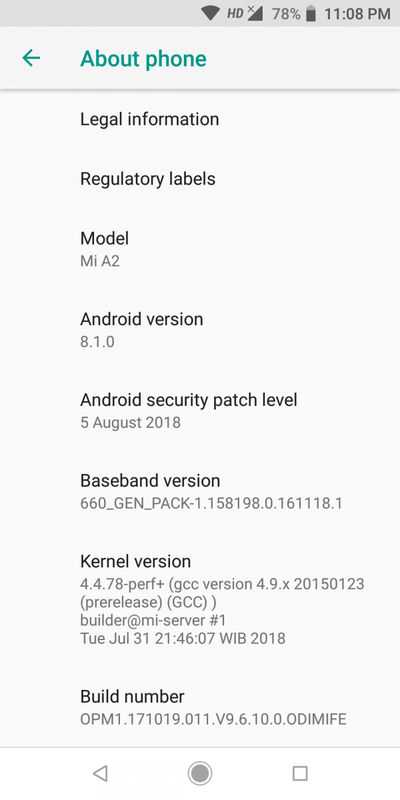 It can be argued that the update roll-out bugs were a result of Xiaomi being new to working with stock Android updates, but the problems did lead to a lot of user frustration. That argument is moot this year as Xiaomi now has a full year of experience, which means that expectations are higher with the Mi A2. Xiaomi has stated that Android Pie will be rolled out to the Mi A2 soon but hasn’t provided an exact timeline yet. We hope that the company takes its time to release a stable, bug-free update. Stock Android 8.1 Oreo has its own set of advantages and disadvantages when compared with MIUI on other Xiaomi phones. The advantages include a much cleaner, simpler UI, having an app drawer by default, and better handling of notifications in general. These plus points are not insignificant. 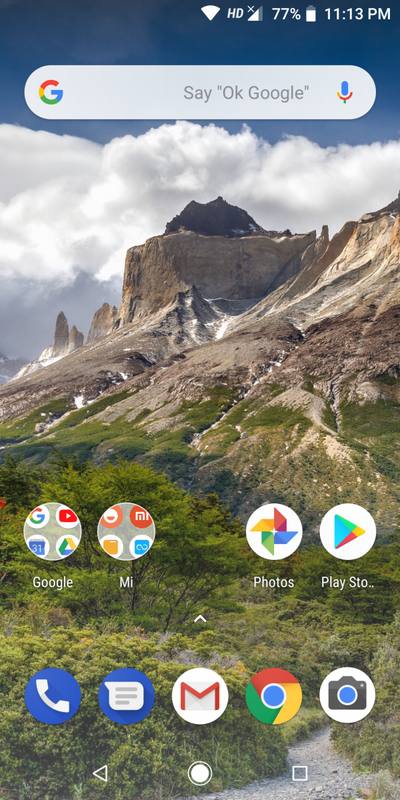 The Settings app is also much easier to navigate than it is on MIUI, and the Material Design aesthetics of stock Android are arguably better than MIUI’s design as well. On the other hand, stock Android has a conspicuous lack of features that are generally added by custom manufacturer user interfaces. 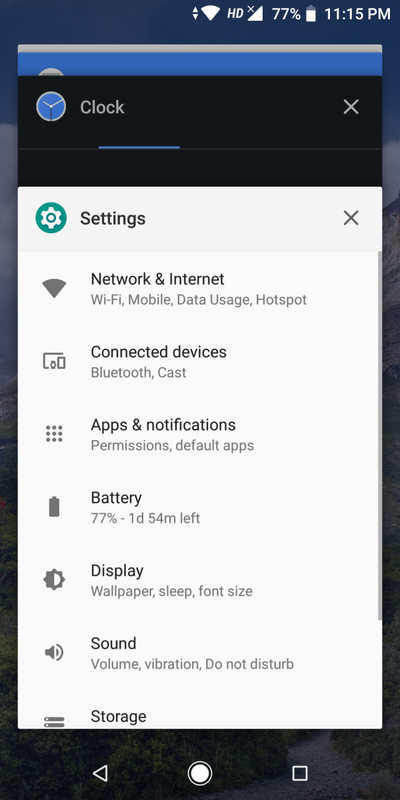 Users have to head to the Play Store if they want features such as network status indicator, the ability to have dual installations of the same app (termed “Dual Apps” in MIUI), pie gestures, navigation gestures, and a lot more. 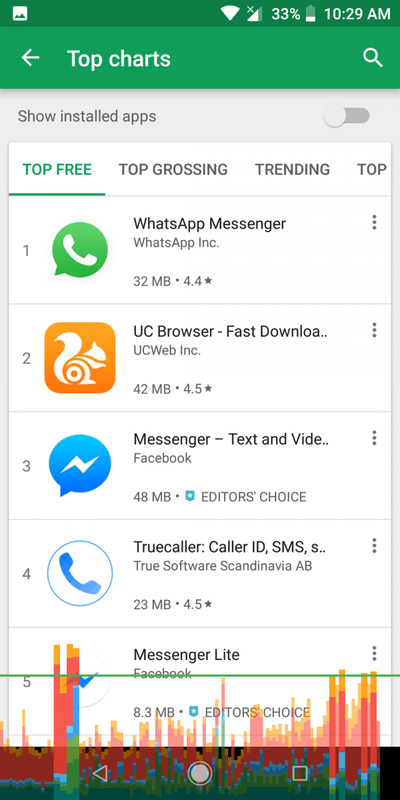 Something as simple as a way to hide the onscreen navigation buttons in all apps is missing in stock Android, forcing users to use ADB. MIUI, on the other hand, does have this functionality, allowing users to use the whole screen estate. 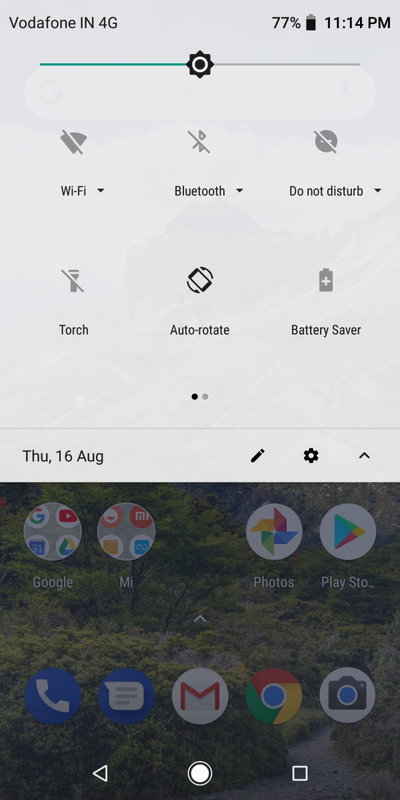 One-handed mode continues to remain absent in AOSP, while Xiaomi has added it to MIUI. There are other niche features in MIUI that have become popular in markets like India, and some of them include scrolling screenshots, call recording, IVR functionality, double tap to wake, and more. 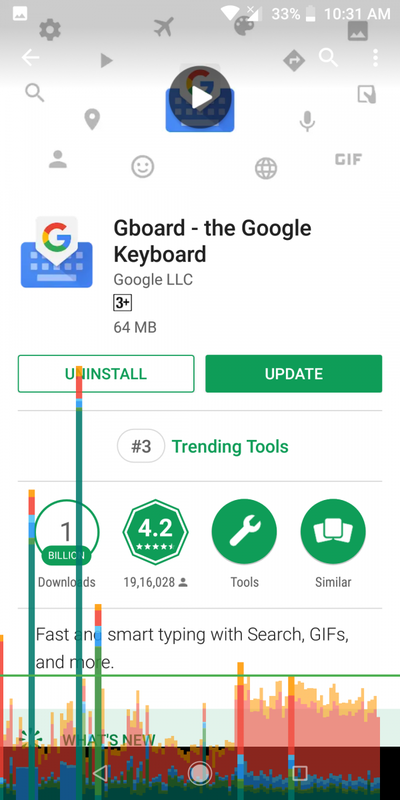 Some, but not all, of this functionality can be brought to the Mi A2 by downloading third-party apps on the Play Store. In light of the above information, the Mi A2’s software is a boon for stock Android enthusiasts, while not being as feature-rich as manufacturer user interfaces. The phone comes with negligible bloatware. Xiaomi pre-loads its Mi File Manager, Mi Drop, Feedback, and Mi Store apps, and users can also download the Mi Remote app on the Play Store to make use of the IR blaster. 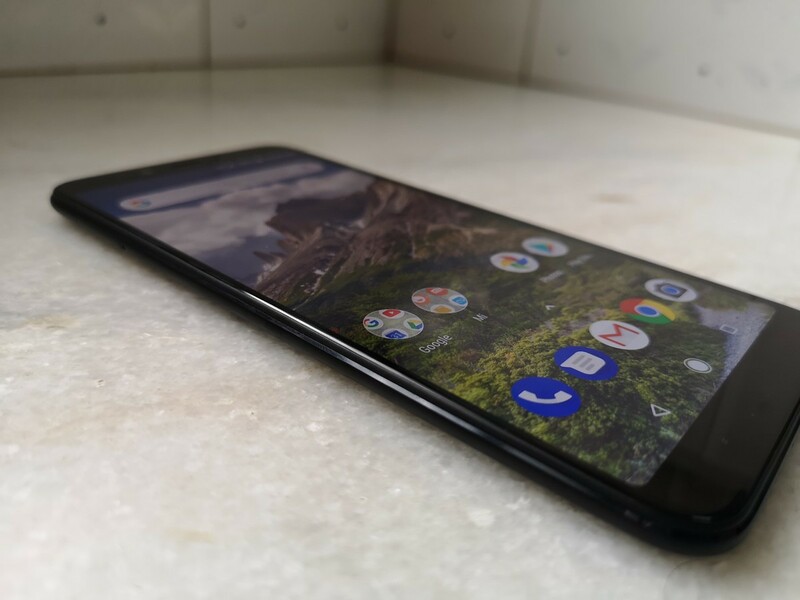 In terms of extra functionality over stock Android, the Mi A2 doesn’t bring much. The only gesture available is double-press the power button to open the camera, which works well. Unfortunately, the gesture of swiping down on the fingerprint sensor to bring the notifications drawer is not present on the Mi A2, although it was there on the Mi A1. Thanks to competition, users can now find more Android One phones in this price segment, but the Mi A2 remains the best Android One phone for the price when it comes to specifications. The software user experience is also clean and usable, and it’s good to work with as a starting point. It’s what stock Android enthusiasts have been asking for since years, and the Mi A2 does its job well in this respect. The Xiaomi Mi A2 is powered by a 3,010mAh battery. The battery capacity is on the lower side for Xiaomi phones, as phones like the Redmi Note 5 Pro and the Poco F1 have 4,000mAh batteries. Software optimization can make up a good deal here, and Xiaomi phones have traditionally been power-efficient. Regardless, it’s a bit disappointing to see Xiaomi stagnating in battery capacity for its flagship Android One phone when even the Mi A2 Lite/Xiaomi Redmi 6 Pro has a 4,000mAh battery. 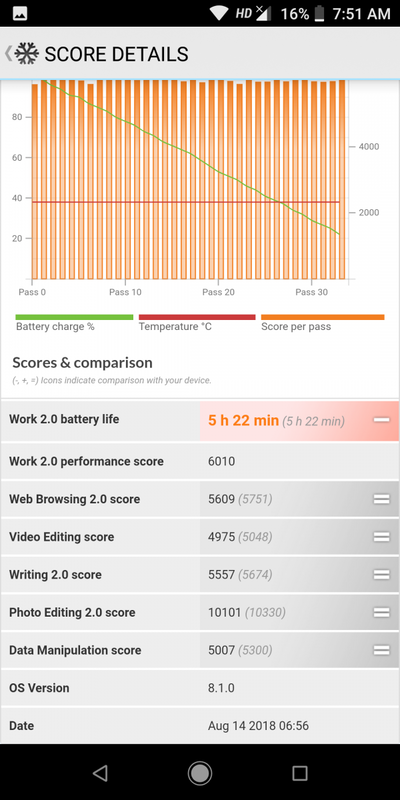 In order to test battery life, I did a full run of the PCMark Work 2.0 battery life test, with display brightness set to 100% (adaptive brightness was switched off). The Mi A2 ran constantly for 5 hours and 22 minutes, which is a relatively average result for a Xiaomi phone. 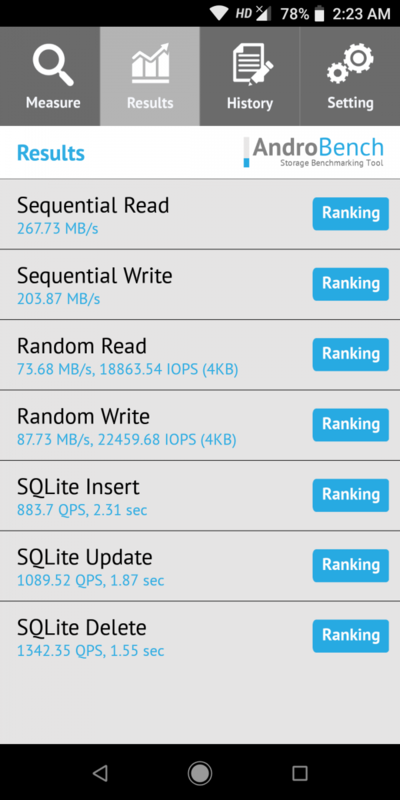 The result appears good when the runtime is compared to the phone’s battery capacity, though. 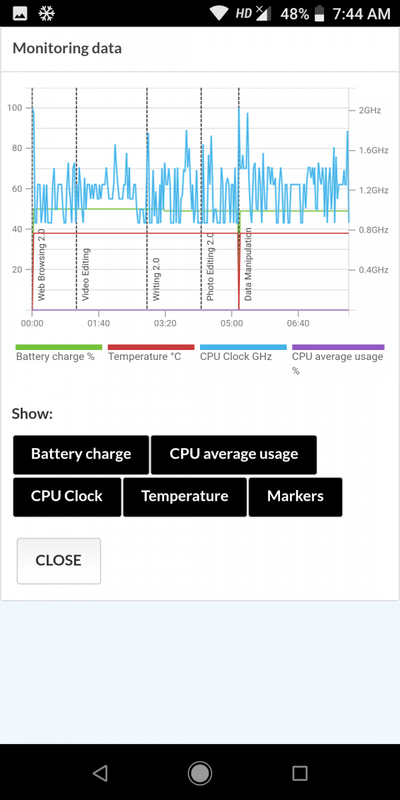 For reference, the Huawei P20 Pro ran for 6 hours and 31 minutes with its 4,000mAh battery and HiSilicon Kirin 970 chip. In the real world, the Mi A2 gets good battery life with frugal idle drain. 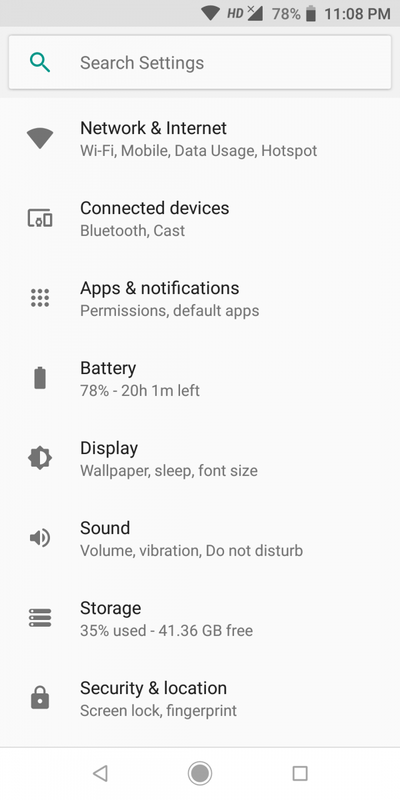 Anecdotally, I have been getting 5-6.5 hours of screen-on time with the Mi A2 on Wi-Fi, with unplugged time varying from 24 hours to 48 hours. 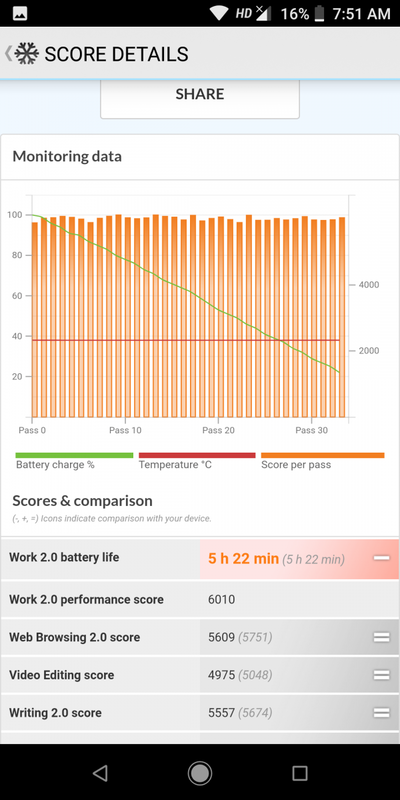 For reference, I could get as much as 7-7.5 hours of screen-on time with similar usage on the Xiaomi Redmi Note 3 in 2016, so the battery capacity deficit does make a difference. In summary, the Mi A2’s battery life isn’t as poor as what users have been thinking. It fails to reach the heights of 4,000mAh-powered Redmi phones, but it still does relatively well when compared with flagships. Light users can expect to charge their phone every 2-2.5 days, while moderate users can get 1-1.5 days. Even heavy users can normally expect 18-24 hours with screen-on times ranging up to 7 hours, but it would be unrealistic to hope for 7.5-8 hours of screen-on time without having an especially light workload. The global variant of the Mi A2 supports Qualcomm Quick Charge 3.0, while Quick Charge 4.0 support is exclusively reserved for the Indian variant of the phone. Unfortunately, Xiaomi bundles a standard 5V/2A charger in the box, which means that users will have to purchase a third-party charger for quick charging. I was unable to test charging speeds using a Quick Charge 3.0 / 4.0 charger due to the fact that I currently don’t have the required chargers. The phone does support USB-C Power Delivery as well. It takes 1.6 hours to fully charge the Mi A2 using a USB-C fast charger that is rated for a maximum of 9V/2A. Cellular call quality was fine in my experience, and I also had no problems with signal reception. The Xiaomi Mi A2 supports dual 4G VoLTE thanks to the Snapdragon 660 SoC. The Mi A2 does not have NFC, which means that NFC-based payment solutions like Google Pay (globally) are out of the question. This may be a deal-breaker for markets where such payment solutions are common. In India, the lack of NFC on the Mi A2 is not a deal-breaker, although we would have liked to see it be included anyway. This is because mobile payment solutions in the country such as Google Pay (formerly Google Tez) don’t use NFC. The lack of a microSD card slot is a fairly significant flaw of the Mi A2, as users no longer have the flexibility that is offered by removable storage. This will be more apparent in emerging markets. On the other hand, the Mi A2’s vibration motor is great. It’s strong enough to provide a good experience in aspects like haptic feedback in the keyboard. Finally, the audio recording quality for voice notes is also one of the strong points of the Mi A2. The Xiaomi Mi A2’s development prospects are bright, although a couple of qualifying factors must be mentioned. To start off, the Mi A2 uses the A/B partition system, just like the Mi A1. We have explained how this can positively affect development. Bootloader unlock is a breath of fresh air after reading many disappointing developments this year. 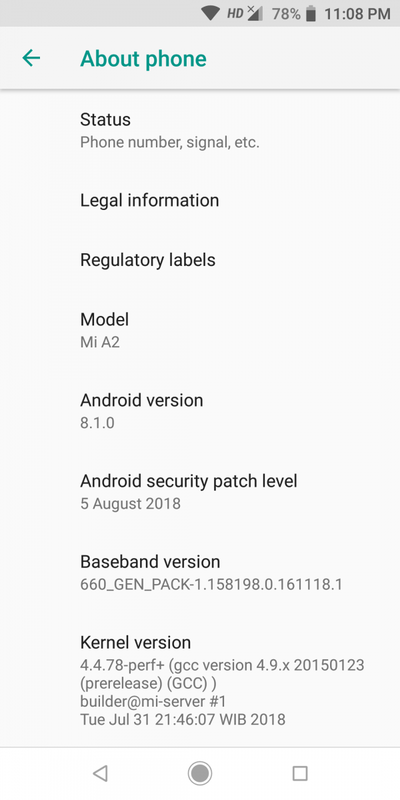 Unlike MIUI-powered Xiaomi phones, users don’t require Xiaomi’s permission to unlock the bootloader of the Mi A2. They can simply type the standard fastboot bootloader unlock commands and the phone’s bootloader will be unlocked in seconds, rather than the 15 days it now takes for most Xiaomi phones to be unlocked. Moreover, Mi A2 users will completely avoid the hassles of using Xiaomi’s Mi Unlock tool. They don’t have to login with their Mi account, and nor do they have to wait for days or weeks to unlock the bootloader. They also don’t have to work their way around bugs and errors. All in all, bootloader unlock simply isn’t an issue on the Mi A2. The next important factor is the kernel source. It took Xiaomi a long time to release kernel sources for the Mi A1, but the company has steadily improved its record in this respect this year. A few months ago, the company committed to releasing kernel sources within three months of a device’s release, and it has been honoring its word since then. The Mi A2’s kernel sources were released on August 27, less than a month after the phone went on sale. We applaud this run of form and hope that it continues. With kernel source released, and easy bootloader unlock, the Mi A2’s development prospects seem bright, but a few qualifying factors must be mentioned. Magisk is already available for the phone (letting users install unofficial Google Camera ports), and an unofficial build of TWRP has also been developed. 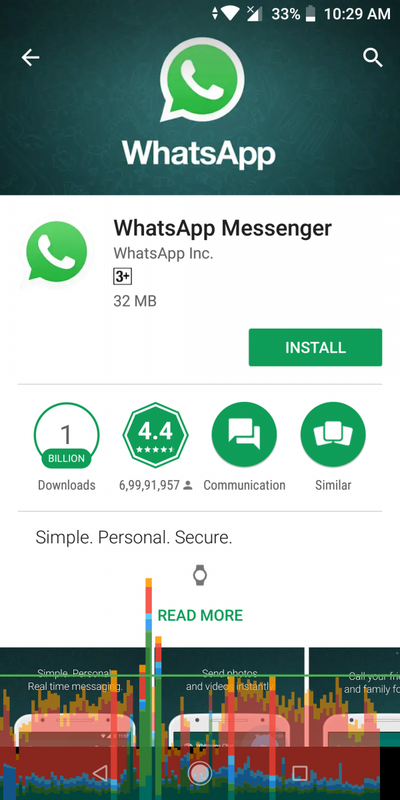 Users can also install Android Pie Generic System Images after unlocking their device’s bootloader. There are no device-specific AOSP custom ROMs yet, but we imagine that at least a few will arrive sooner or later. The major factor which can hamper the Mi A2’s development ironically comes from another Xiaomi phone: the Poco F1. The Poco F1 isn’t that much more expensive than the Mi A2, and it’s specifically promoted as being developer-friendly. It also has significantly better specifications, and it arguably has an even better value proposition. If the user popularity of the Poco F1 ends up higher than the Mi A2, it’s not unreasonable to imagine that developers will buy the Poco F1 and develop for it instead of developing for the Mi A2. Poco has recently announced that the wait time for bootloader unlocking is now three days, down from 15 days, on the Poco F1. Ultimately, time will tell whether the Mi A2’s development gets off the ground or not. 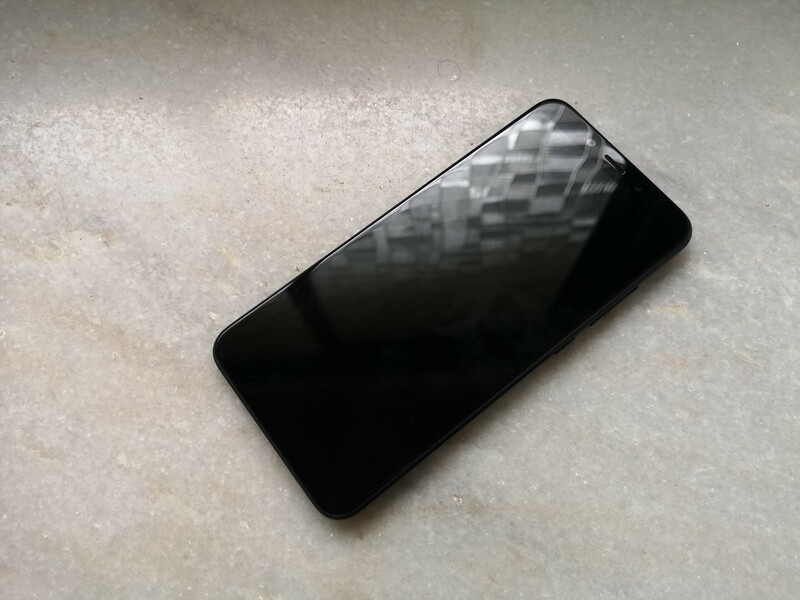 The Mi A1 had a slow start because of the lack of availability of kernel source, but development progressed to the point where unofficial Android Pie ports are available for it. We hope that development for the Mi A2 lives up to the fine tradition of previous Xiaomi phones that were very popular on XDA. The Xiaomi Mi A2 is an interesting phone that aims to follow in the footsteps of its predecessor. The Mi A1 turned out to be a popular phone for enthusiast users, and Xiaomi is hoping to achieve similar, or even better, success with the Mi A2. The design and build quality of the Mi A2 are superb. The use of unibody aluminium is a pleasant change after seeing so many phones be launched with more fragile materials. The phone also pays attention to detail in several small respects such as the fingerprint-resistant back coating. The display of the Mi A2 has its merits and demerits. It would have been a great display had Xiaomi included a working, calibrated sRGB mode, but as it is, the phone sadly provides inaccurate colors with no color profiles. Strengths include good viewing angles, low color shift, and great clarity, while weaknesses include the lack of high brightness mode and a pink tint that affects grayscale accuracy. 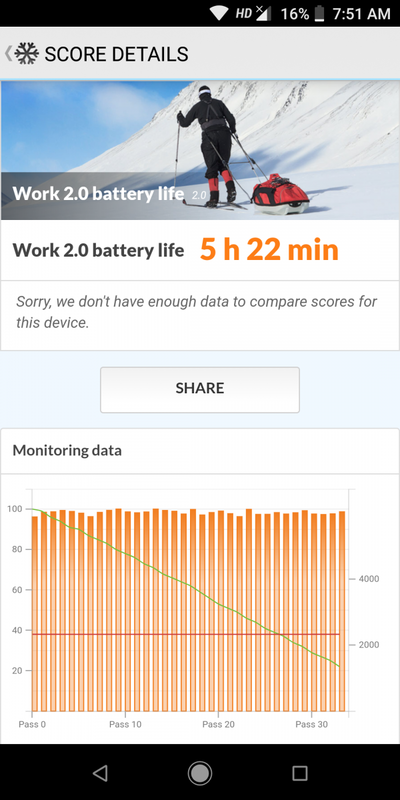 Performance-wise, the Mi A2’s system performance is admirable. The Snapdragon 660’s CPU is a proven chip, and real-world performance is great for the price. On the other hand, GPU performance isn’t as impressive, but that’s more a fault of Qualcomm refusing to upgrade its mid-range GPUs at a quick pace, which has led to them falling significantly behind flagship GPUs. RAM management is fine. It would have been good to see UFS storage instead of eMMC 5.0, as storage speed is one respect where the deficit to flagship phones is quite high. The Mi A2’s dual camera setup is another strong point. Image quality is good in almost all conditions, although issues with HDR auto do need to be solved in order to let the camera reach its full potential. Low light photography is handled competently as well, but it falls below higher-priced phones, as expected. The same strengths and weaknesses are carried over to video recording. It was a pleasant surprise to see EIS active on [email protected] videos, and EIS in general works very well. There are some weaknesses related to exposure and detail, but all in all, the Mi A2 offers a very competent smartphone camera at an affordable price tag. It’s worth repeating that this is as good as it gets for image and video quality at this particular price point. Audio is where the Mi A2 faces its most significant issue. 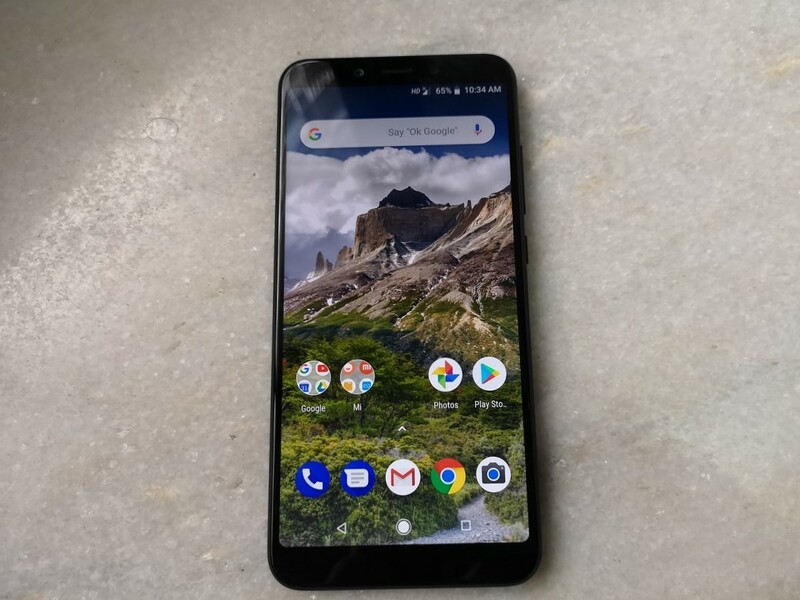 At this price range, nearly all smartphones have opted to keep the 3.5mm headphone jack, but the Mi A2 follows the lead of more expensive Xiaomi phones by opting to remove it. This can have repercussions for usability in day-to-day scenarios, and ultimately, it’s not a decision that I can get behind. The software experience remains another positive factor. Android One ensures monthly security updates, and the stock Android 8.1 Oreo user experience is great. Things will only improve here once the Android Pie update arrives. However, the software experience can be thought of as weakness if out-of-the-box features are the only criteria. Battery life is also pretty good despite the relatively small 3,010mAh battery. Going up to a 4,000mAh battery capacity would have resulted in superb uptime, however. This means that Xiaomi left easy improvements on the table. Finally, we arrive at the pricing. The Mi A2’s 4GB RAM/64GB storage variant is priced at ₹16,999 in India and €280 in Europe. The phone’s primary competitor is the Honor Play, which is priced slightly higher at ₹19,999 in India and €329 in Europe. The Honor Play has a faster SoC, taller display with a notch, and a bigger battery, but the Mi A2 has its own advantages of having Android One and a lower price tag. The Xiaomi Redmi Note 5 Pro/Redmi Note 5 AI Dual Camera, the Asus ZenFone Max Pro M1, and the Nokia 6.1 Plus can also be competitors at lower price points. The Redmi Note 5 Pro, in particular, has a bigger battery, a hybrid SIM/microSD card slot, and a 3.5mm headphone jack. It’s ₹2,000 cheaper than the Mi A2, but the Mi A2’s advantages include a faster SoC, better build quality, cleaner software, better cameras, and faster updates. Similarly, the ZenFone Max Pro M1 has a much bigger 5,000mAh battery, a dedicated microSD card slot, a 3.5mm headphone jack, and a much cheaper price tag. In terms of speed, camera performance, and build quality, however, the Mi A2 comes out ahead. The Mi A2 clearly offers more value than phones such as the Nokia 7 Plus, OPPO F9/F9 Pro, and any of Samsung’s mid-range phones. Despite sharing quite a few specifications with the Nokia 7 Plus, it manages to have a lower price tag by a substantial amount (₹9,000). Incredibly, even Xiaomi’s Poco F1 can be thought of as a competitor. In India, the phone’s starting 6GB RAM/64GB storage variant is sold for ₹20,999 ($299), while it’s priced at €329 in Europe. The difference in price is slight, but the Poco F1 offers better specifications in almost every respect. The Mi A2’s few advantages over the Poco F1 include arguably better build quality, easier bootloader unlocking, the presence of an IR blaster, and potentially faster updates. The software is a toss depending on users’ preference for stock Android over MIUI and vice versa. Overall, the Xiaomi Mi A2 has a strong value proposition. If users can deal with its constraints, they will find a reliable phone that can easily keep up with most use cases. It’s just that it arrives at a time when the flagship Poco F1 is already arriving in the market for a slightly higher price.